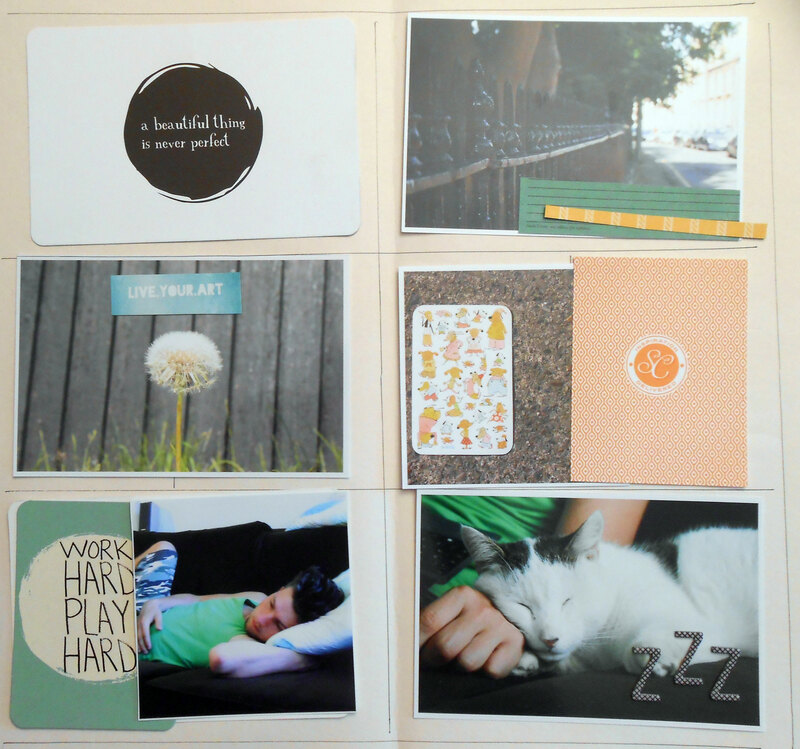 It’s Timi here today with a Project Life spread. 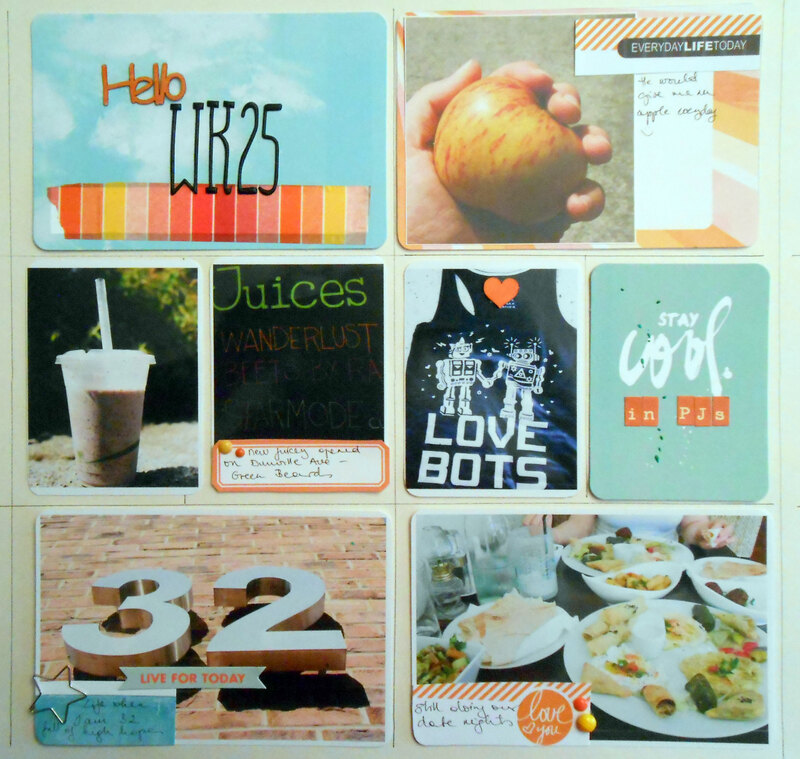 Sometimes I have so many photos for a week, it’s hard to decide which to include in my spread. And then, there’s no space left for journaling. 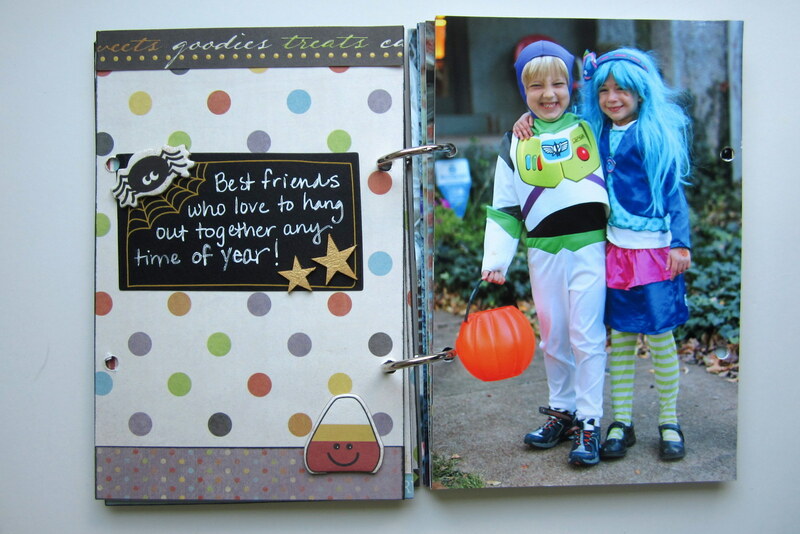 In this spread instead of adding lots of journaling I added some mini title to my photos. This way I could share the atmosphere of photos. 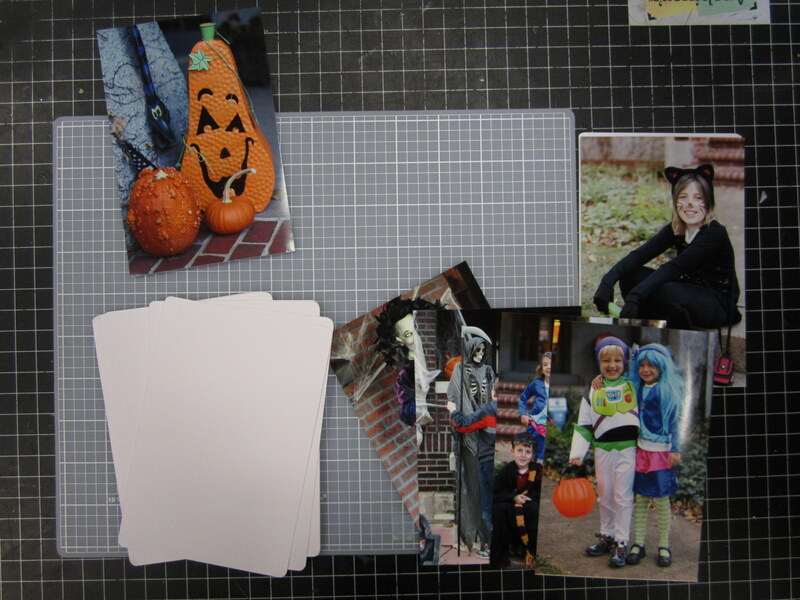 Lay down the photos on your desk. 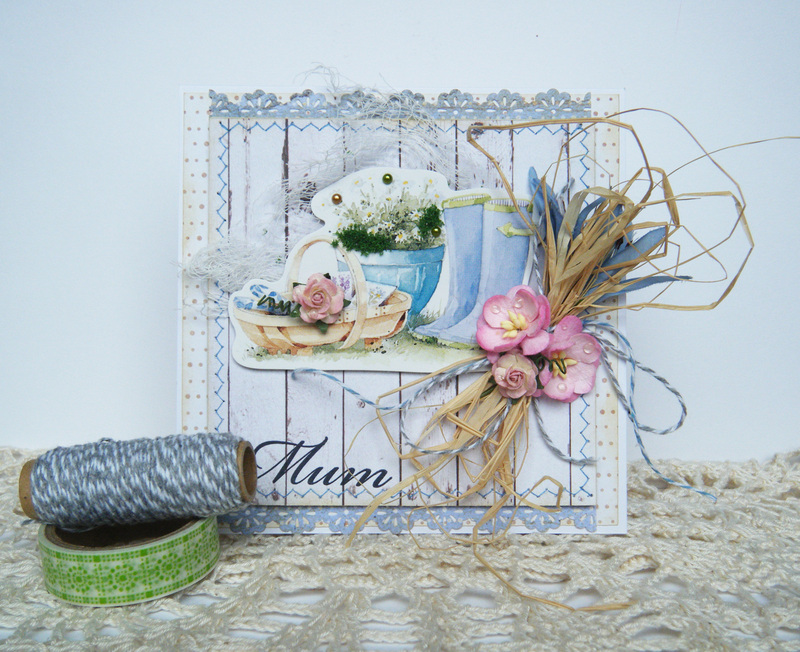 I like to take my box of labels and cards out and try to find something that would suit each photo. 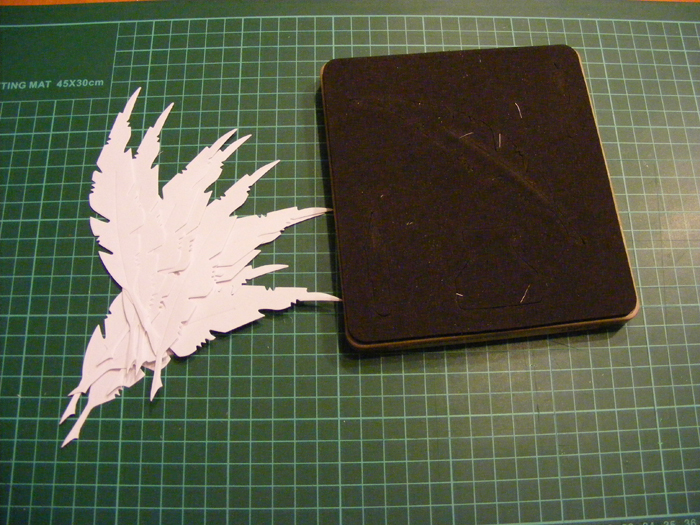 I also don’t mind cutting cards into little pieces if there is only a small bit that I want to use from it. 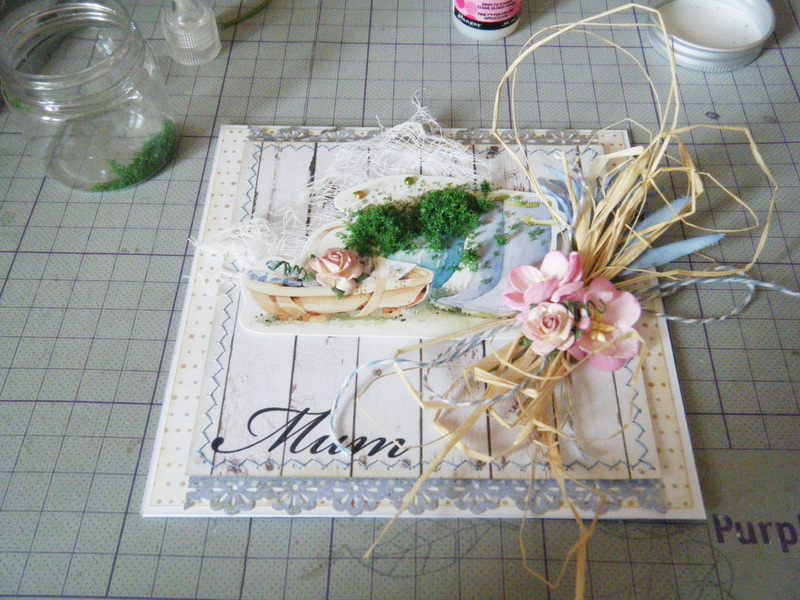 In this picture you can see that I used one packaging from Studio Calico. I keep everything that might be useful later on a spread. This was just the perfect colour. 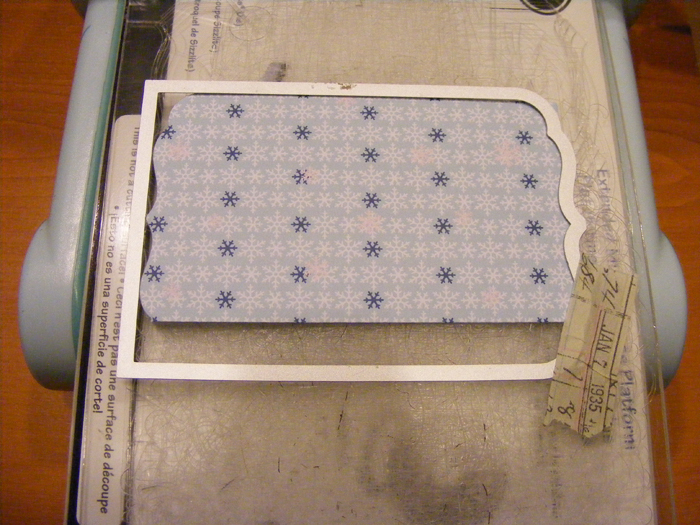 I glued down the labels and mini titles and added some washi tape here and there. As you can see I changed the title card. Photo idea: Recently I really like to take photos of house numbers. They can be really cool. 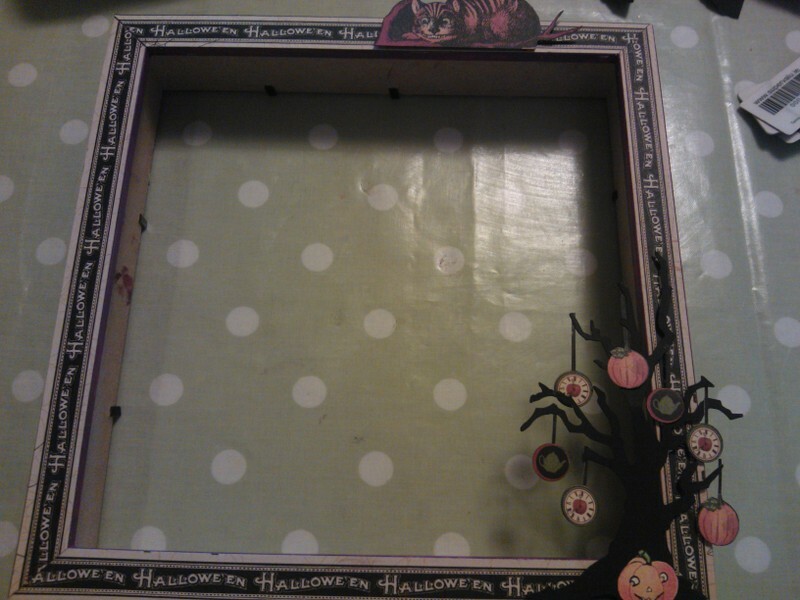 I also added a flair button and pieces of chipboard. 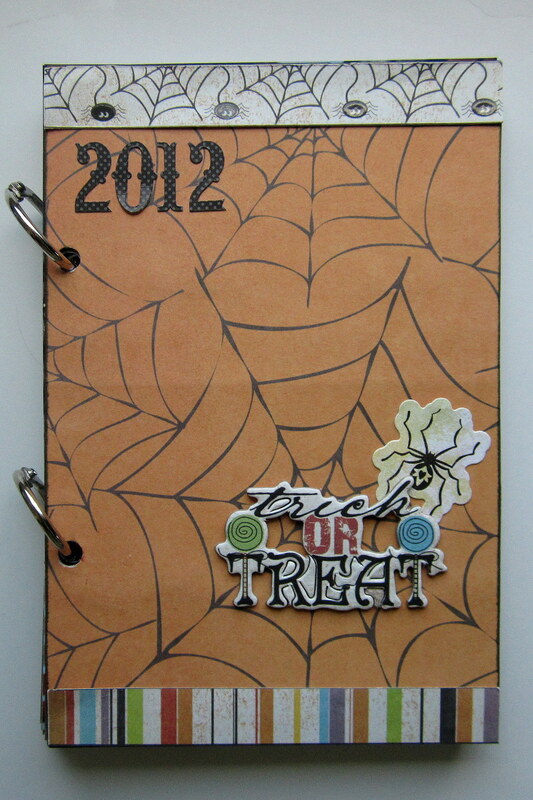 Last step is to add little embellishment like enamel dots and the journaling. I wish I had a sewing machine I would then add some stitching too. 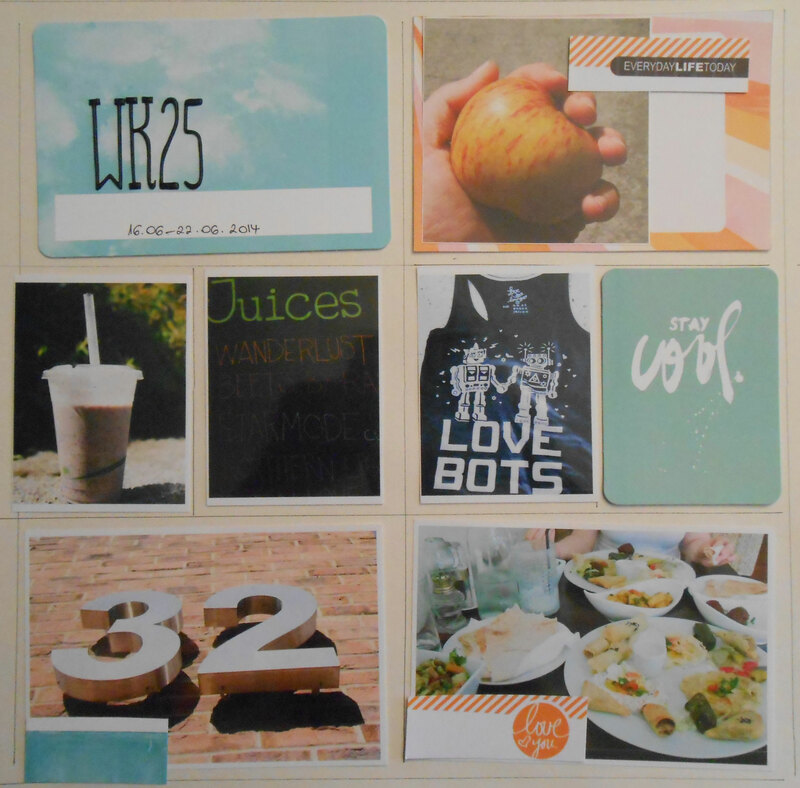 I hope you like this Project Life page and if you feel like sharing your PL spreads with us, leave a comment below with a link of your creation. 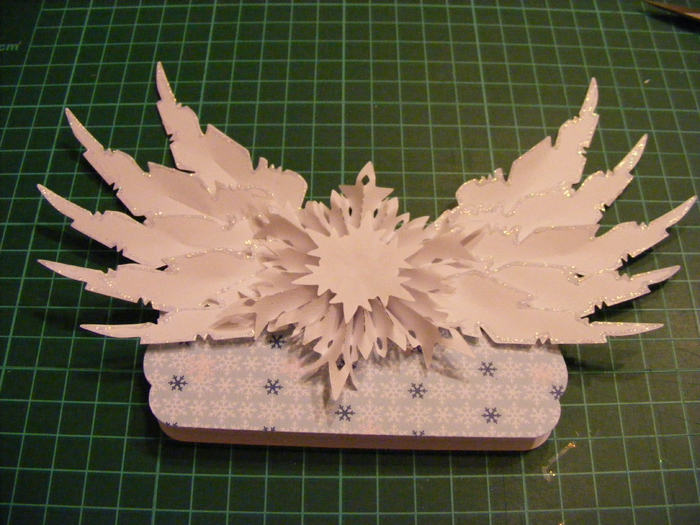 Die cut 10 feathers and the snowflake rosette. 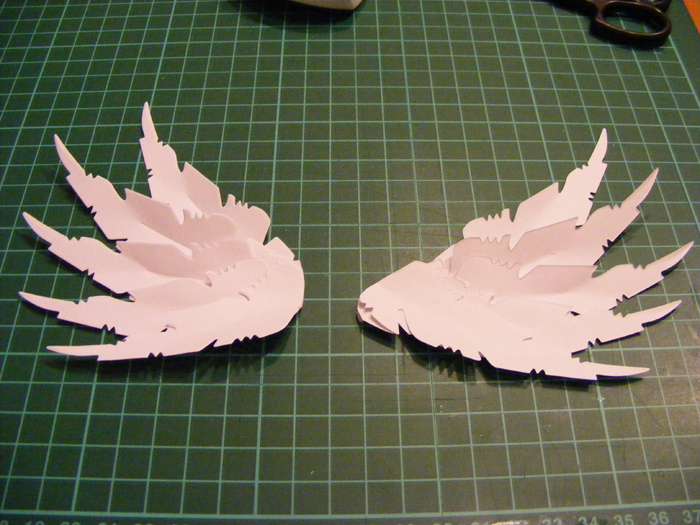 Layer 5 feathers into a shape of a wing, cut the excess of and glue them together. Repeat this with the other 5 feathers. 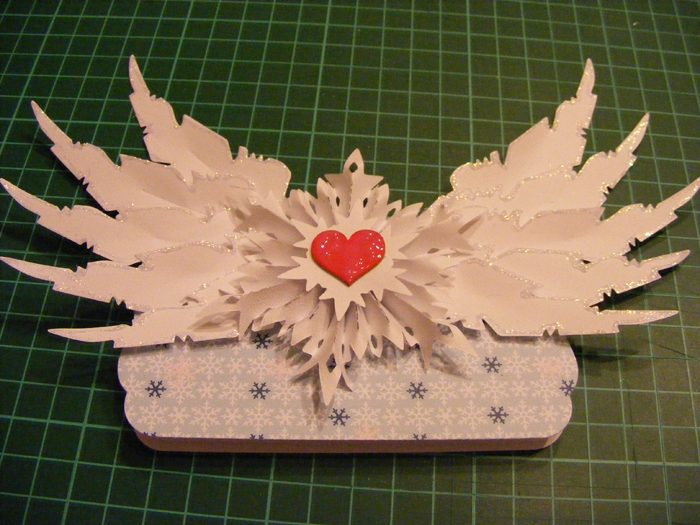 Place the wings on the card base, leave a little space between them for the snowflake rosette. 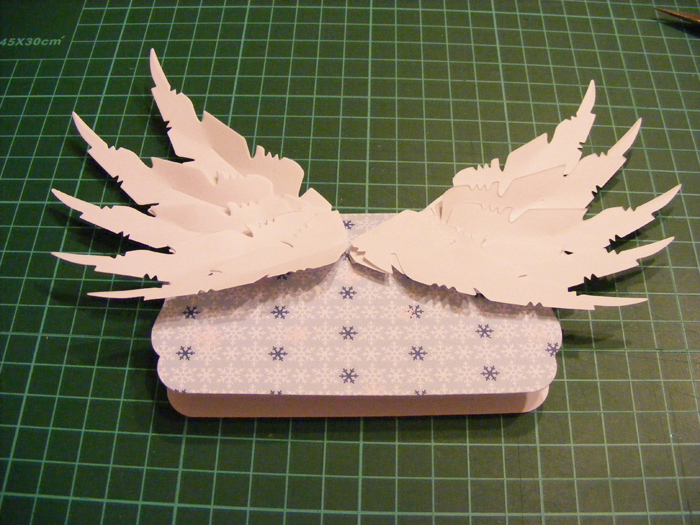 Add some stickles to the edges of the wings for a bit of sparkle. 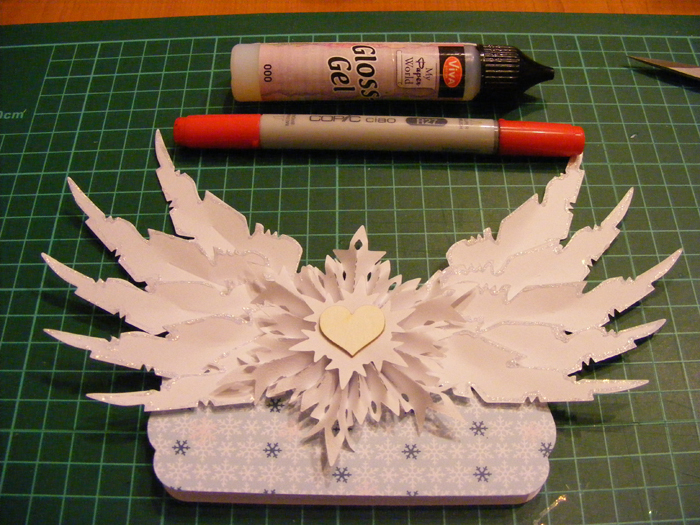 Place the snowflake rosette between the wings and glue it down. 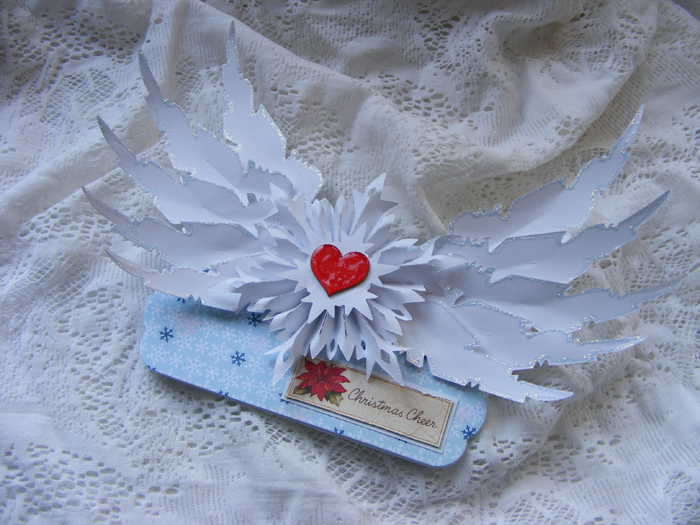 Add a chipboard heart to the centre of the snowflake rosette. Colour it with a marker and add some Glossy gel for some dimension. This is a fantastic dimensional card. A big thanks to Andrea for the tutorial. Welcome back to our Day 11 in our 12 Days of Christmas. 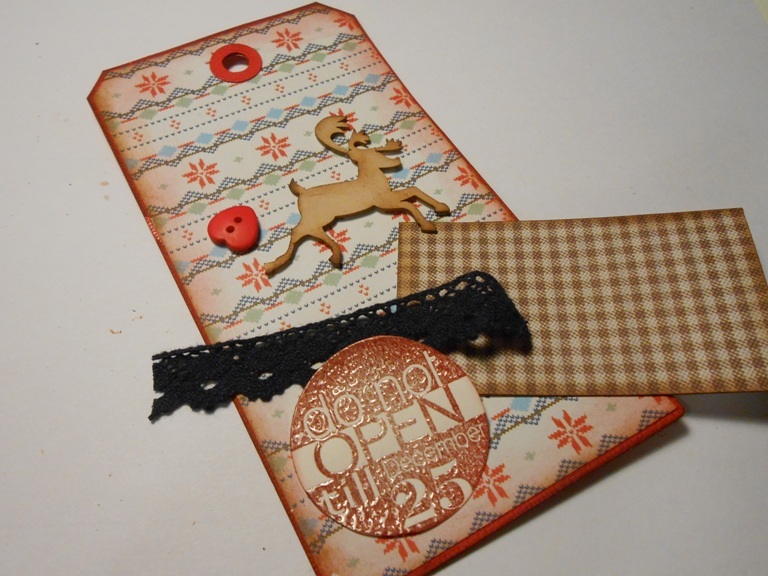 Today Andrea is going share a beautiful tag. 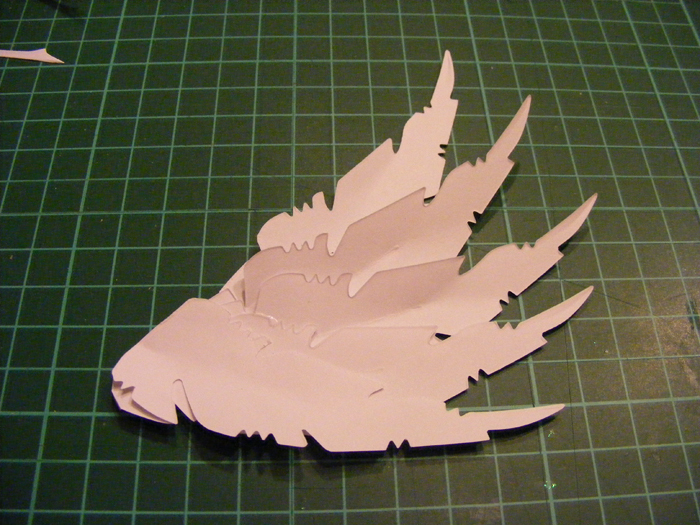 Die cut all the shapes and text you will need. Start layering the elements. 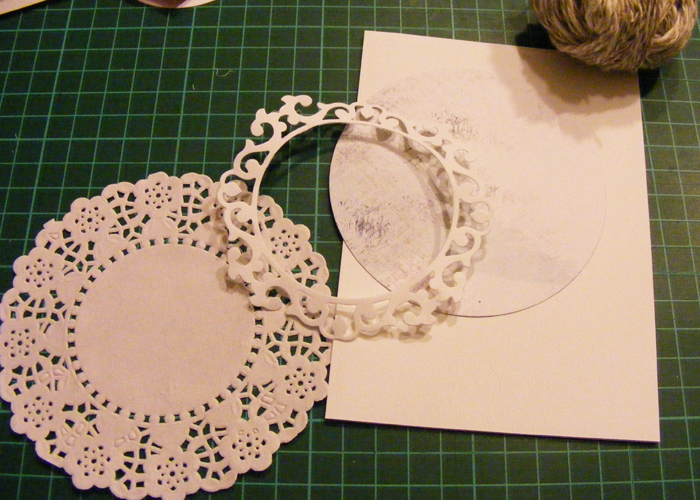 Put down the doily paper first, then the circle and then the round frame. Adhere them to the base card. 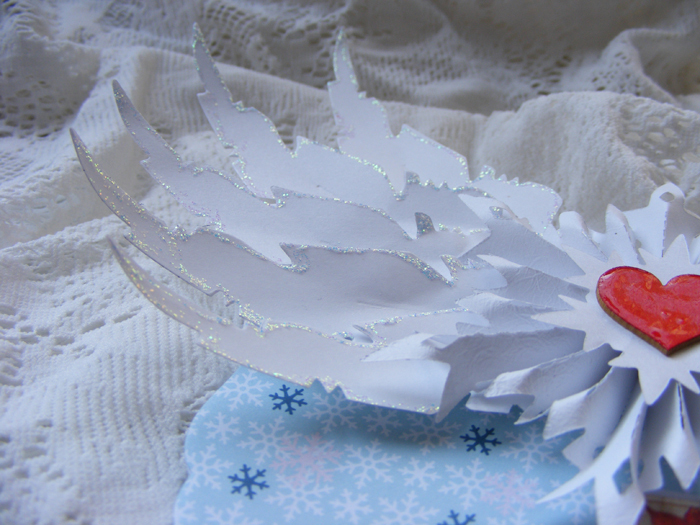 Add the diecut snowflakes to you creation. Add some twine in a round shape and glue it down. 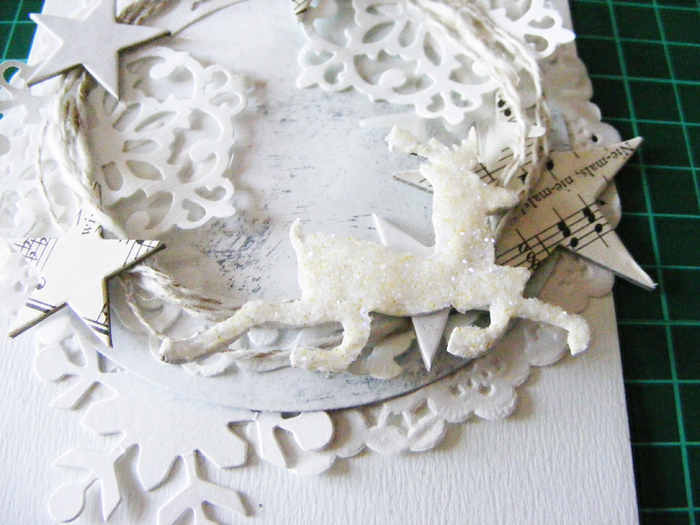 Then add some stars, some can go on the top and some can go between the twine layers. 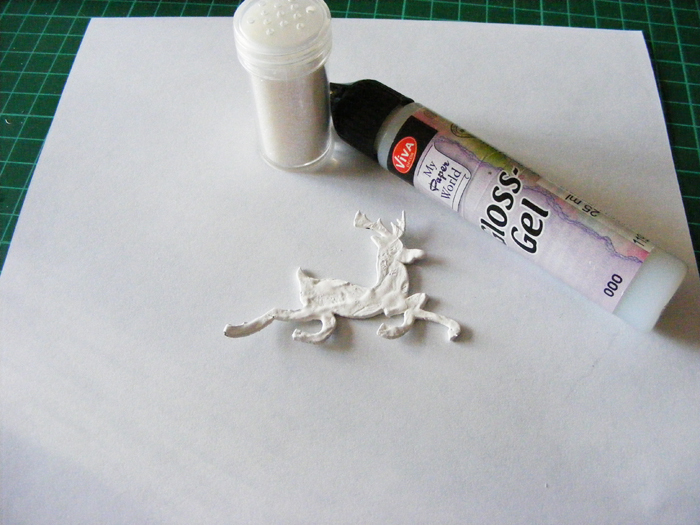 Take a chipboard reindeer, piant it white with acrylic paint. Add Glossy Gel and some glitter to it for more sparkle. 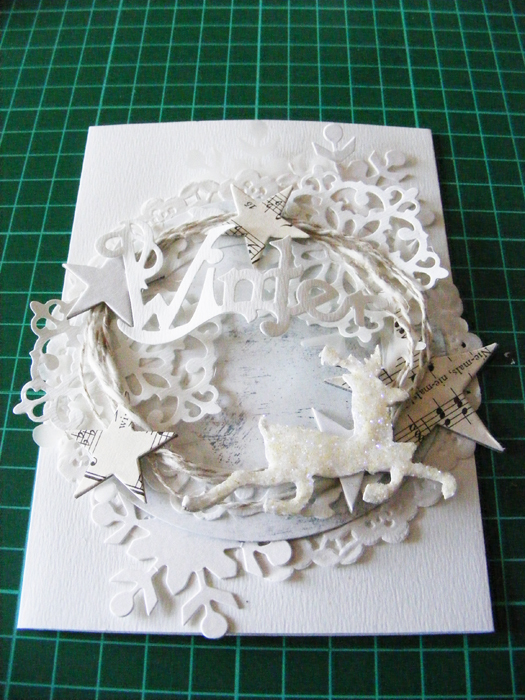 Add the reindeer to the composition and add a ‘winter’ title too. 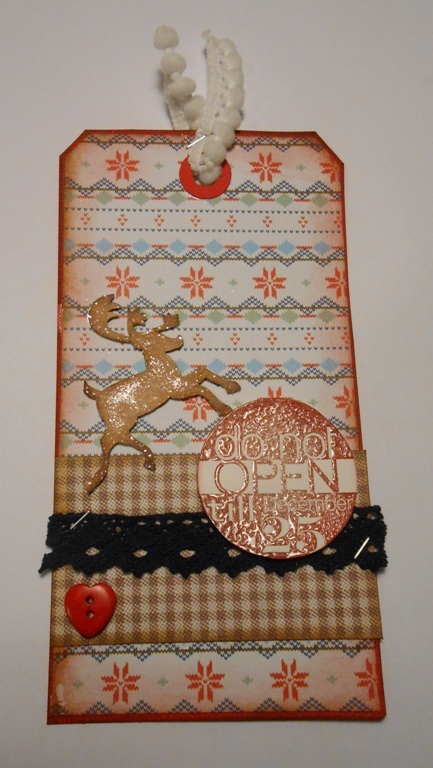 I absolutely like Andrea’s tag, it is so feminine and I just love all the layers. Come back tomorrow for the last day of the 12 Days of Christmas! 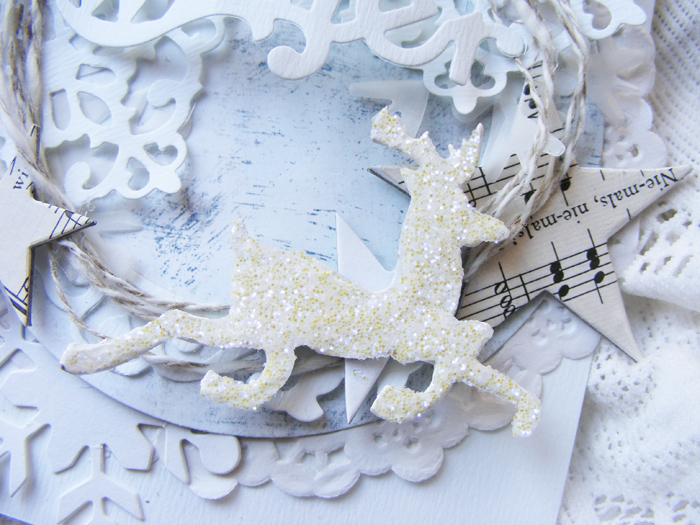 Hi all and welcome to Day 10 of the Crafting Ireland 12 Days of Christmas. Today Katya is going to show us a very cute pinecone tutorial. 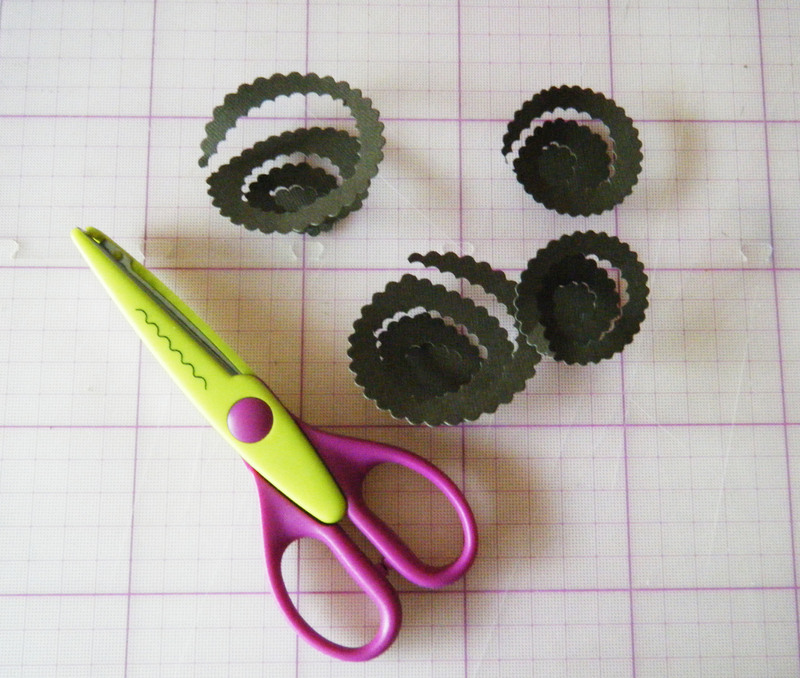 Using scalloped scissors, start cutting from the edge in a spiral. 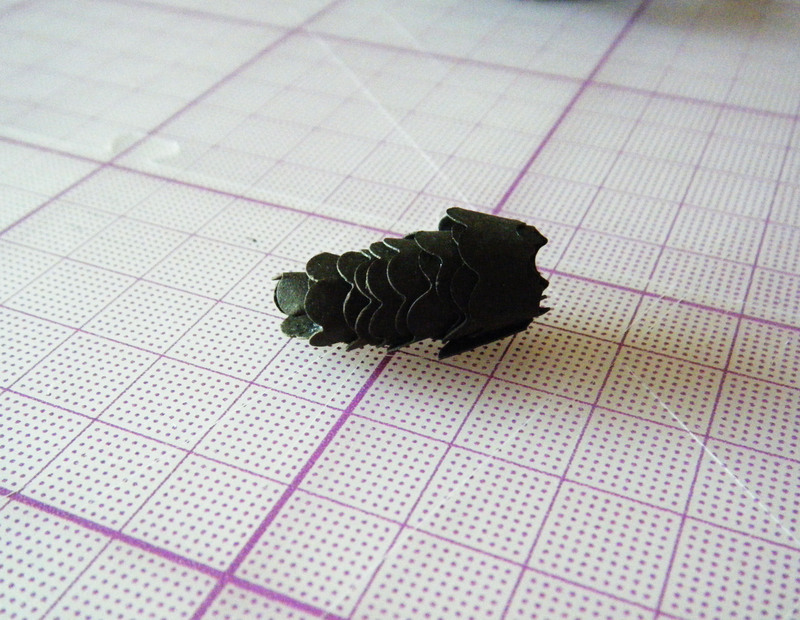 Then starting from the inner part, twist the cardstock to form a cone. Add a glue dot every couple of twists. 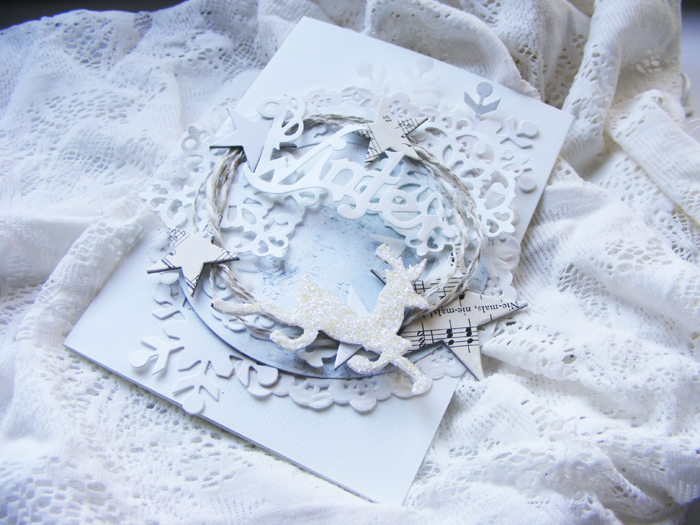 You can leave it as is and use it to decorate your cards. 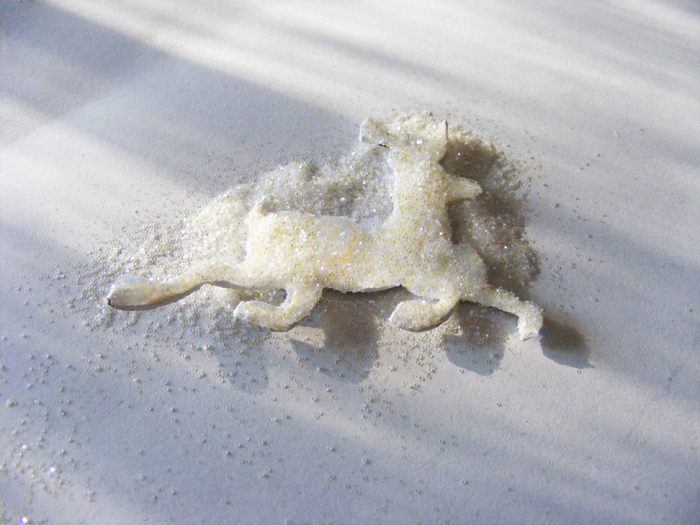 Or you can go one or two steps further and using acrylic paint do an imitation of snow and sprinkle with glitter. I hope you like this fantastic tutorial. There’s only two days left from our 12 Days of Christmas, come back tomorrow for Day 11! 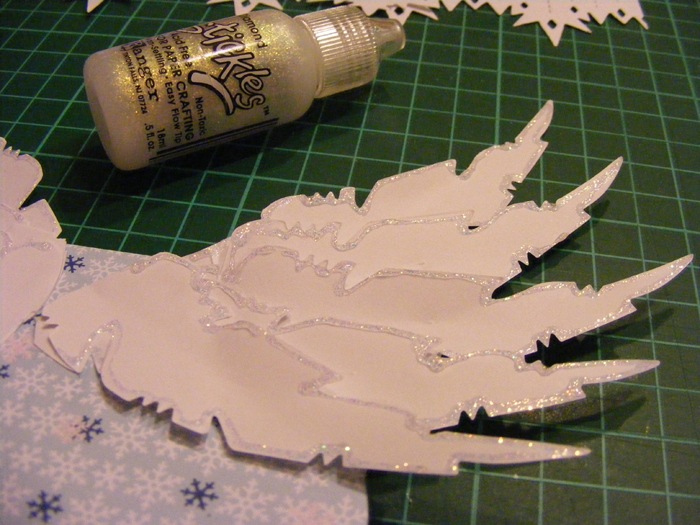 Today our DT member Andrea is going to show us a few ideas on how to create Christmas trees on a project. 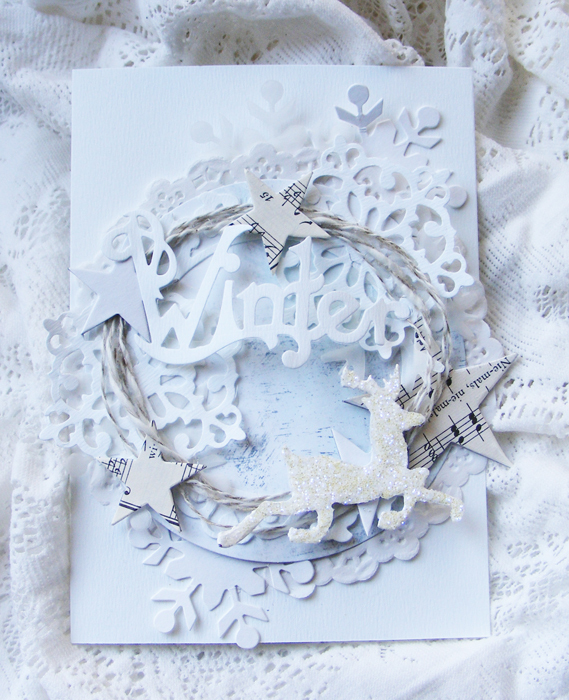 ‘Tis the season for all kinds of tree-laden cards and tags. If you’re looking for a couple of trees that are a little different than just a stamped tree image, check out these two designs. 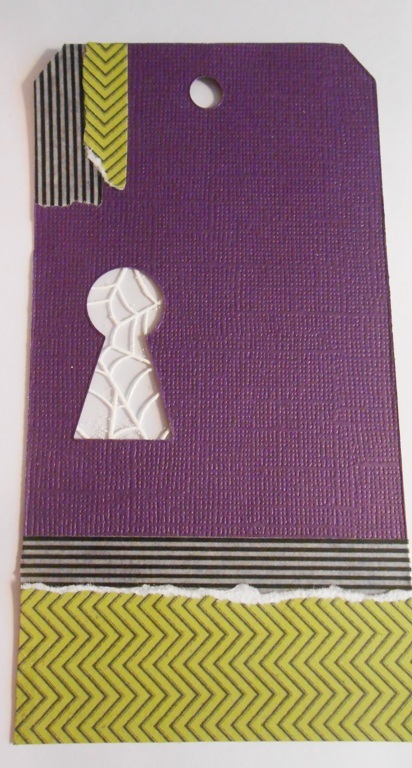 They add a bit of dimension and texture to any paper project you might have on your list. 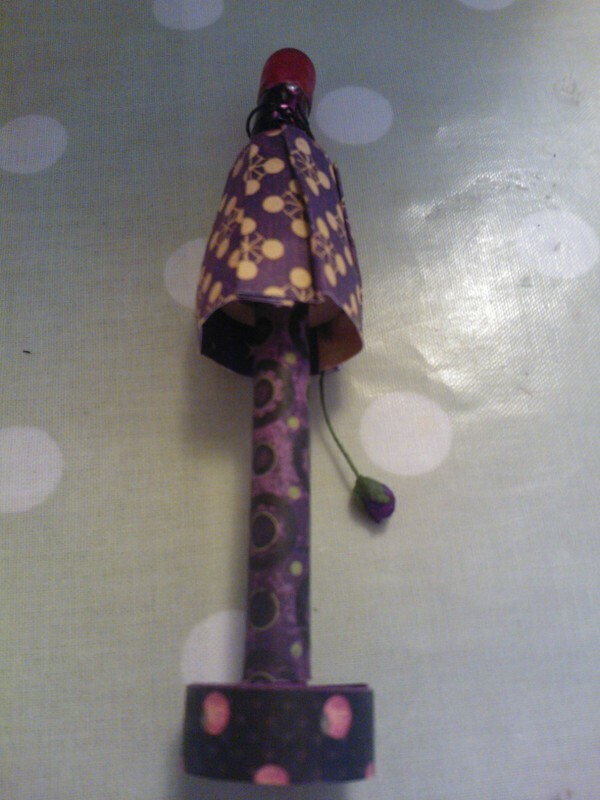 The first is a fabric tree that’s quick to make and that looks great on gifts and packages. I attached mine to a gift card tin. 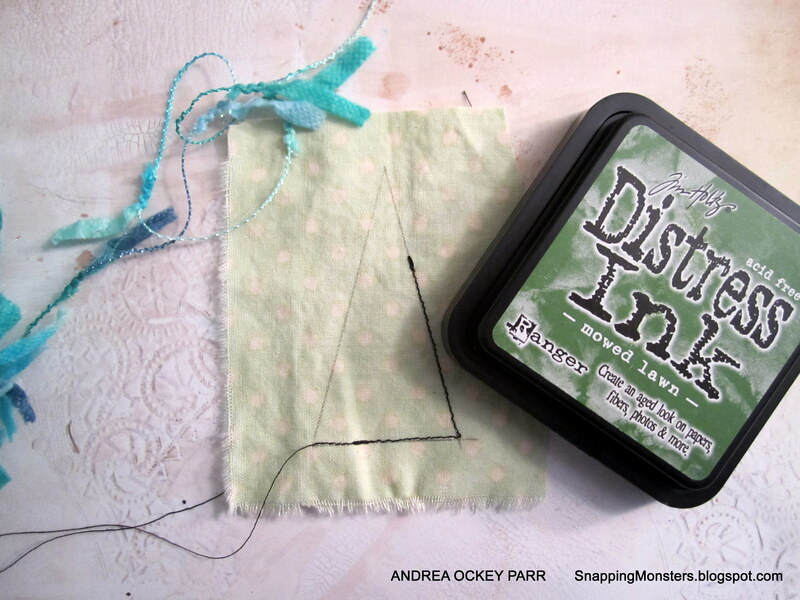 Start by drawing a triangle on a piece of fabric. 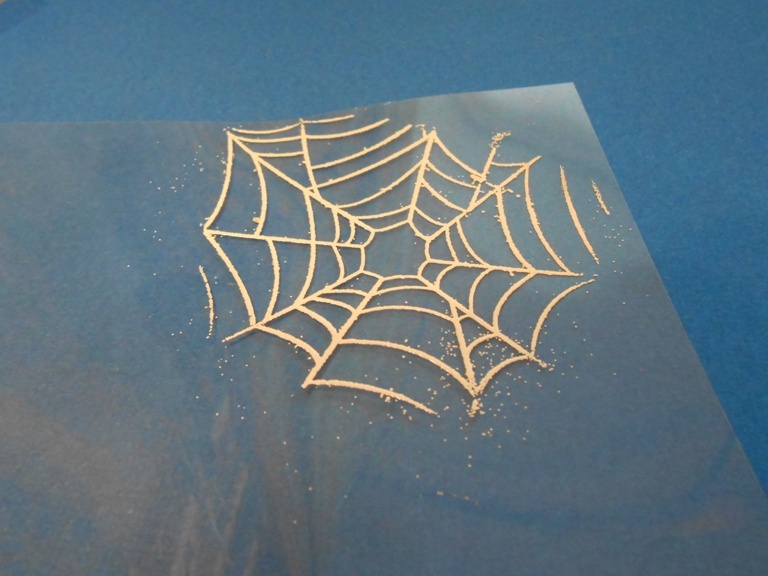 Then sew around it with black thread or draw “fake stitches” around it with a Sharpie. You can see on this example where I started to sew around my penciled-in tree image. Once your tree is outlined either with thread or drawn-on stitches, cut out the tree and glue it to a cardstock or chipboard triangle of the same size so it has some stability. Ink around the edges of the fabric (I used Tim Holtz’s Mowed Lawn ink). All that’s left is to take some fancy yarn or ribbon and wrap it around the triangle to simulate tree ornaments or garlands. Add a puffball or star sticker on top and you’re done! 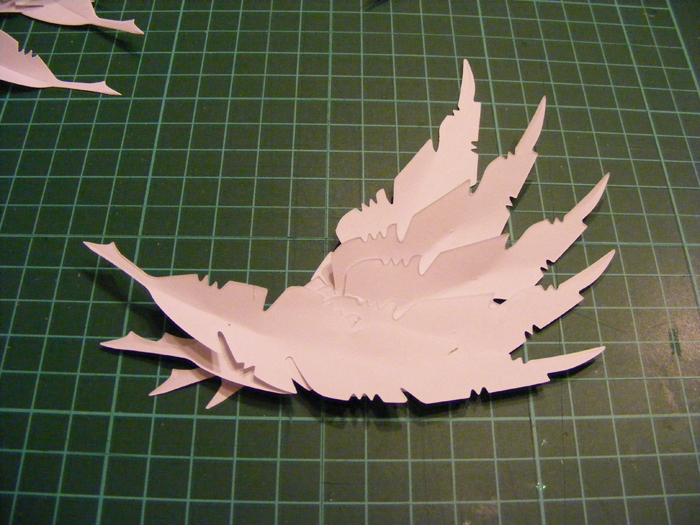 Cut out a triangle in the shape of the tree you want. 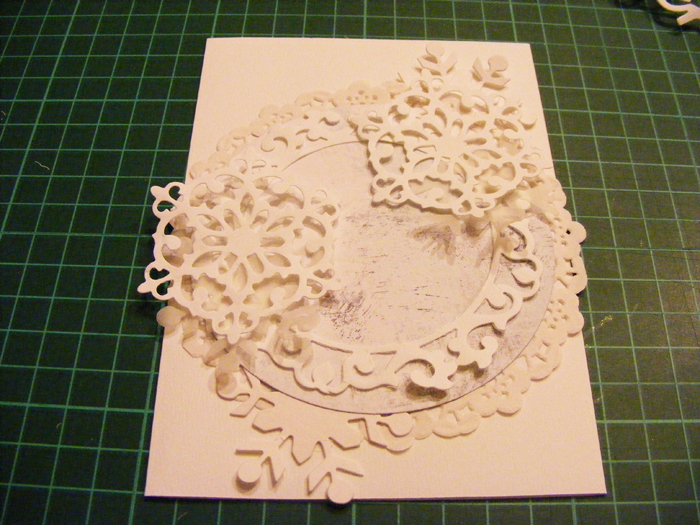 Run it through the paper-crimping tool (I used Marvy Uchida’s Corru-Gator). 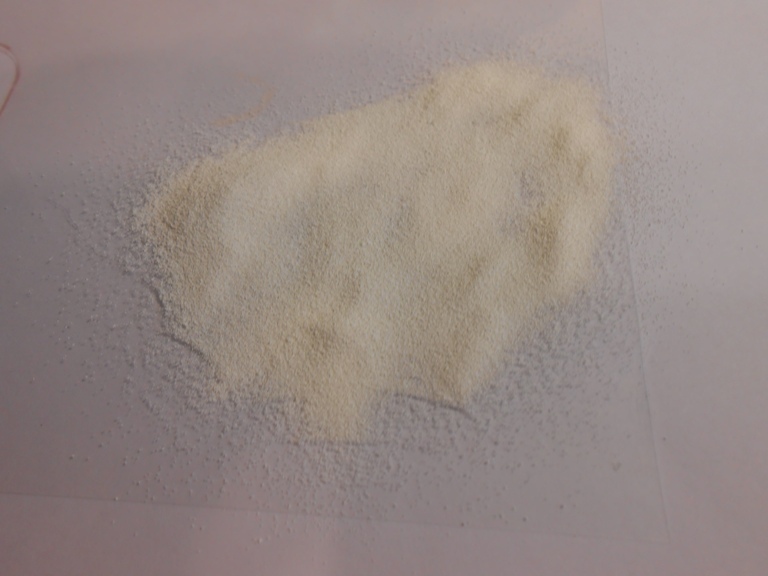 In this picture, you can see how much dimension is added by one simple pass through the crimping tool! 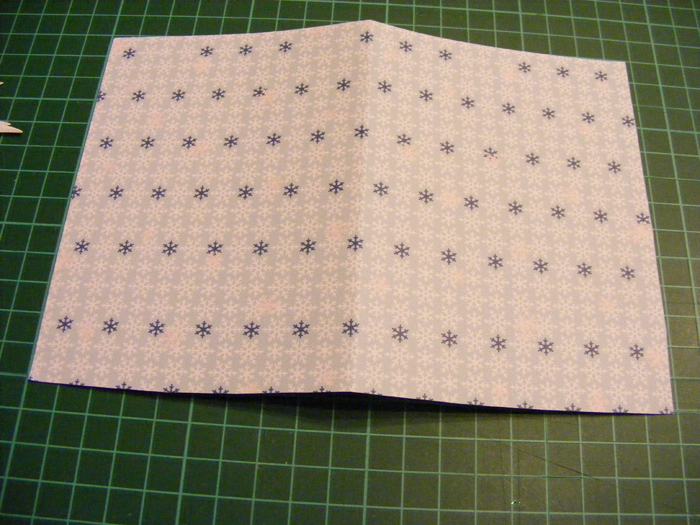 But if you don’t have a paper crimper, you can also just score the accordion fold lines using a scoring board. After you’ve folded your tree, rub across the surface of it with various inks to make the folds stand out even more. Adhere it to your card or tag and you’re done! Easy and unique! Fantastic ideas, big thanks to Andrea! Back again with another Halloween project. Are you excited about Halloween already? 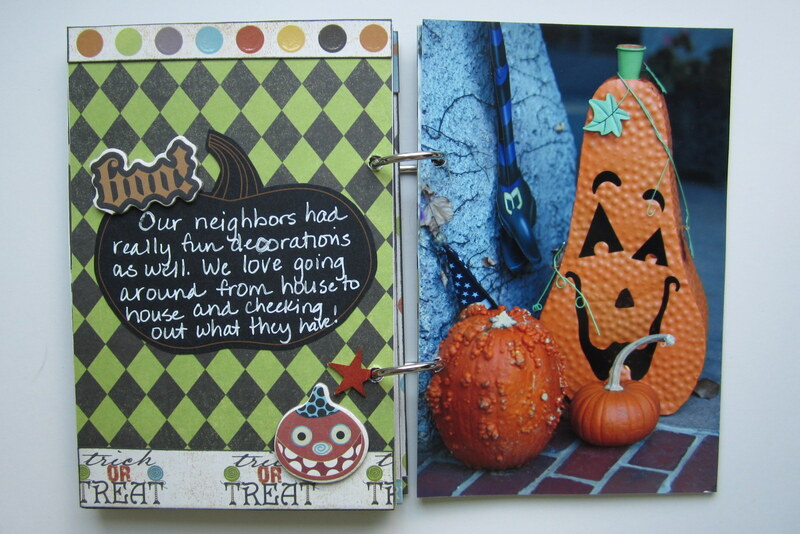 Today Mary Jo is sharing a Halloween Mini with us. 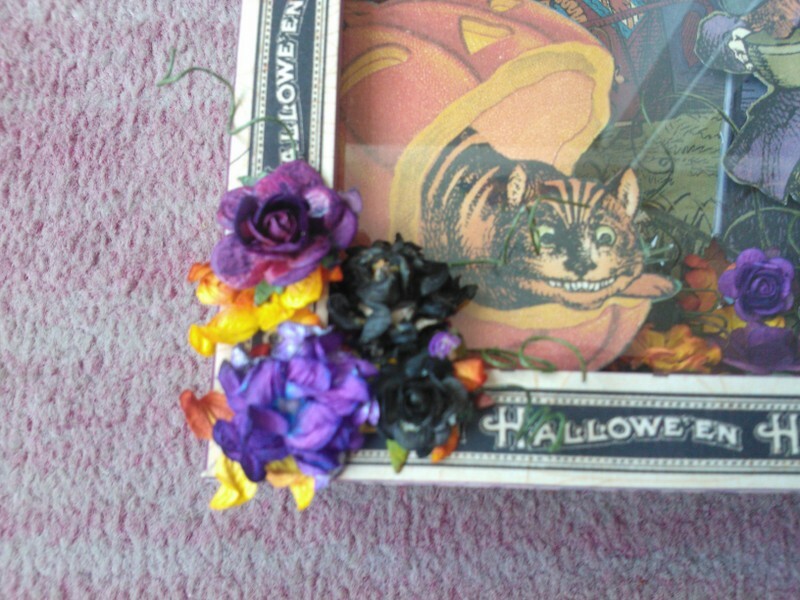 Halloween is a favorite holiday in our home! We celebrate big every year with some fun and familiar traditions. I wanted to capture some of the memories from Halloween last year. 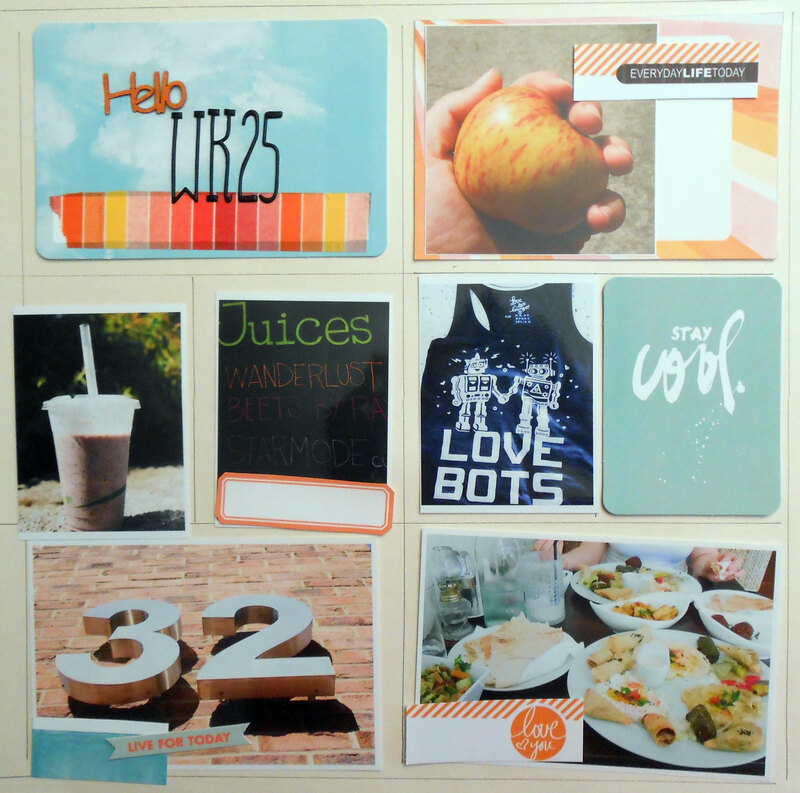 A mini album seemed the perfect format to do this since I could include several photos and journaling inside giving me more space than a traditional layout. As you look through my album though, you may notice one goof. 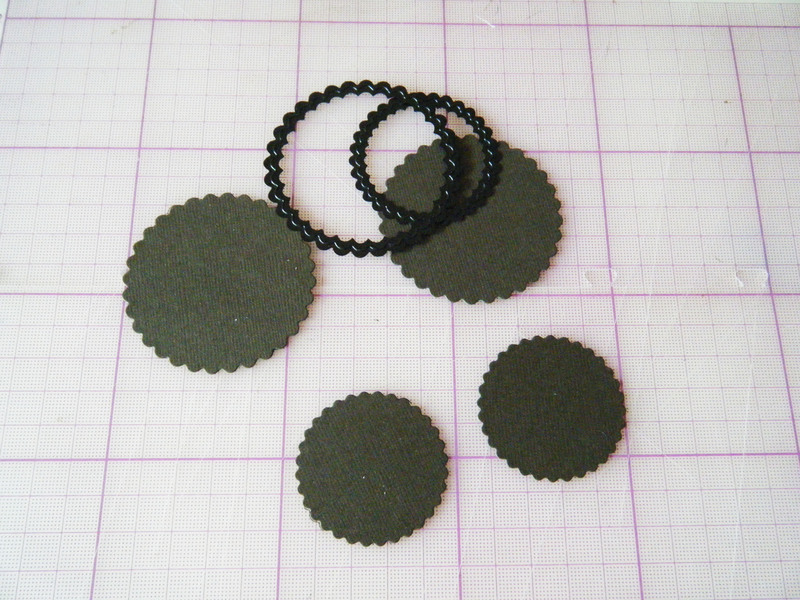 As I was punching the holes for my rings to bind the book, I realized I had punched holes on the wrong side for several pages. Instead of stressing and starting over, I decided to just go with the flow. This album is going in a basket of minis that I keep in our living room, so it will be handled a lot. And I am pretty sure my intended audience will not care one bit about a few extra holes. But just make sure that you line up your pages so they are facing the correct way whenever you go to punch holes for a mini! 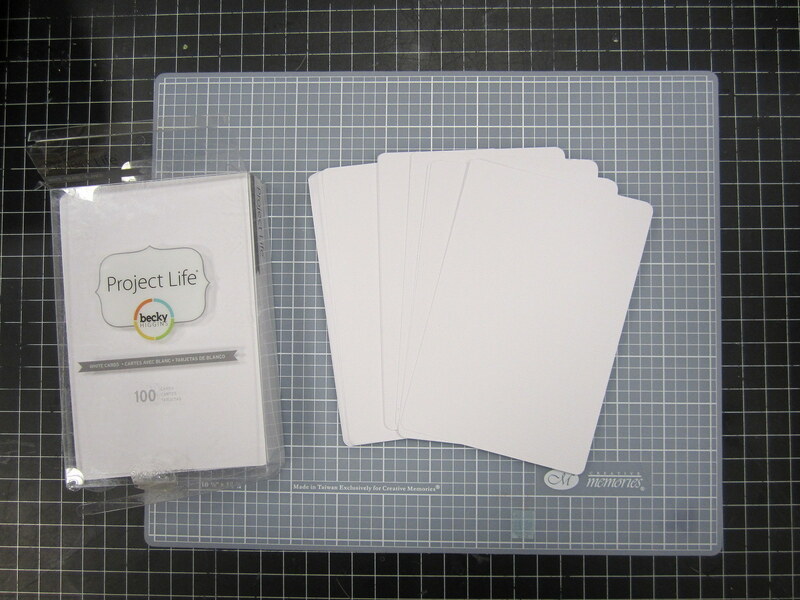 When I was looking at a pack of 100 4×6 plain project life cards by Becky Higgins, I knew that there were a ton more than I probably needed! 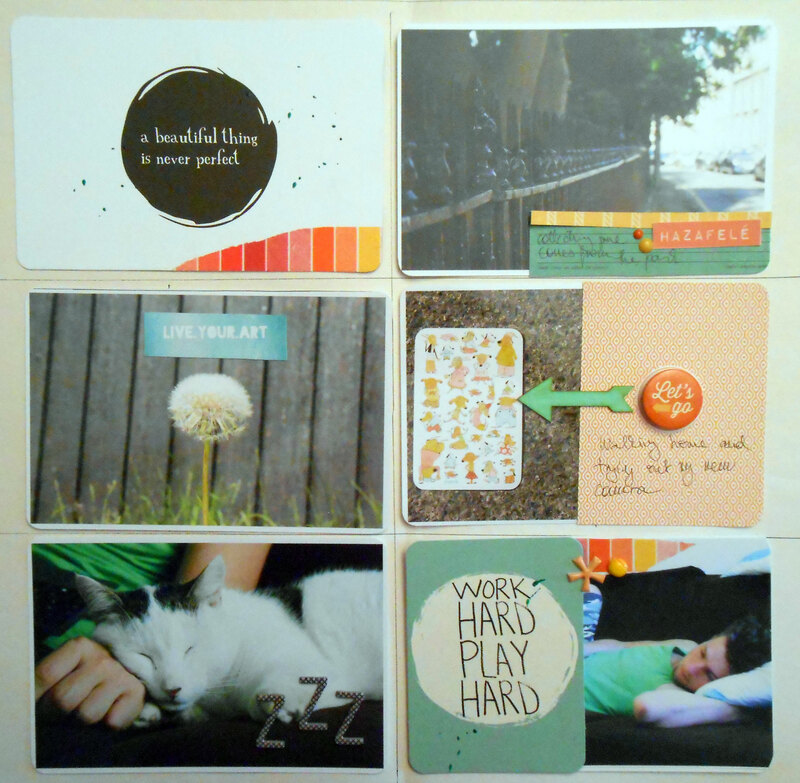 Then the thickness of the cards made me think of the pages of a mini album. 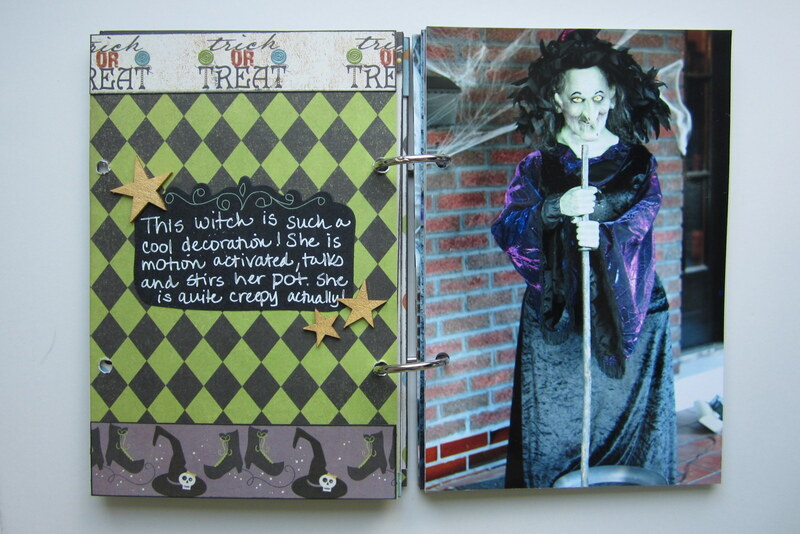 So I decided to use some of the cards to create pages for my Halloween mini. 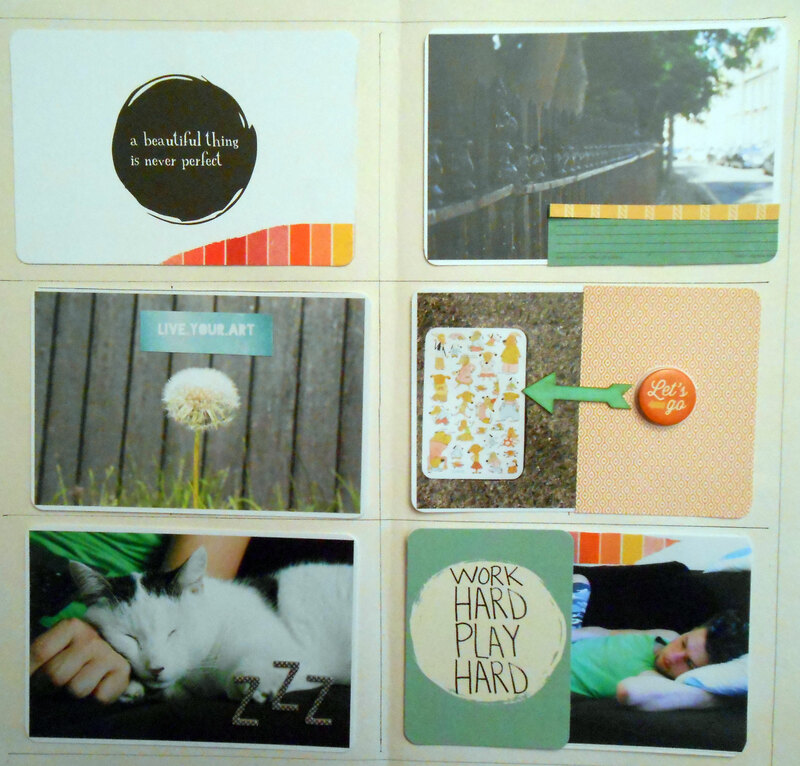 I also noticed the cards were the exact same size as my photos, and I love the look of using a photo as the entire page. 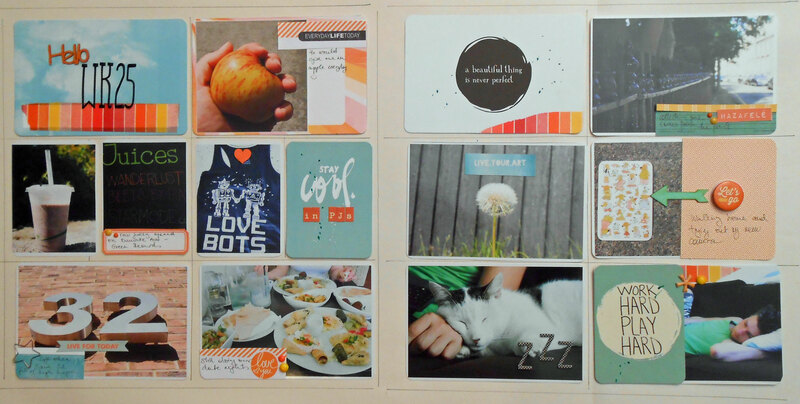 So I glued each photo to one of the Project Life cards. 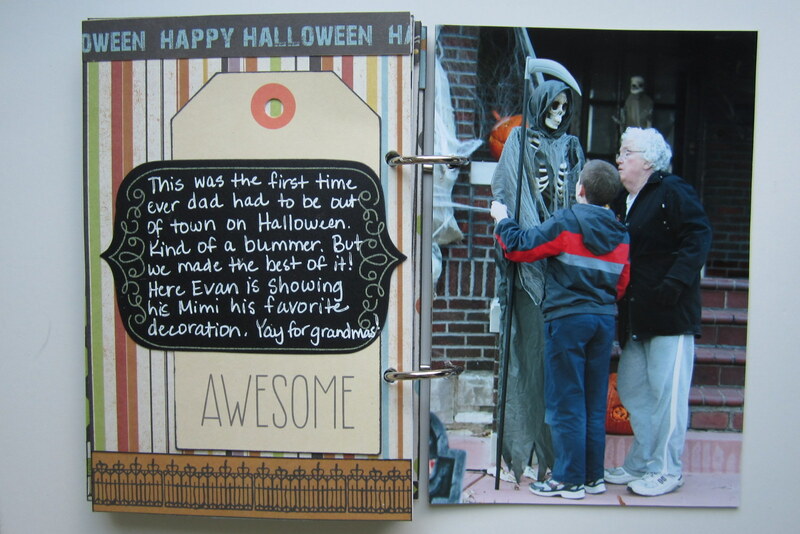 I knew at this point that I was going to follow a pattern of an embellished page with journaling next to a photo page. 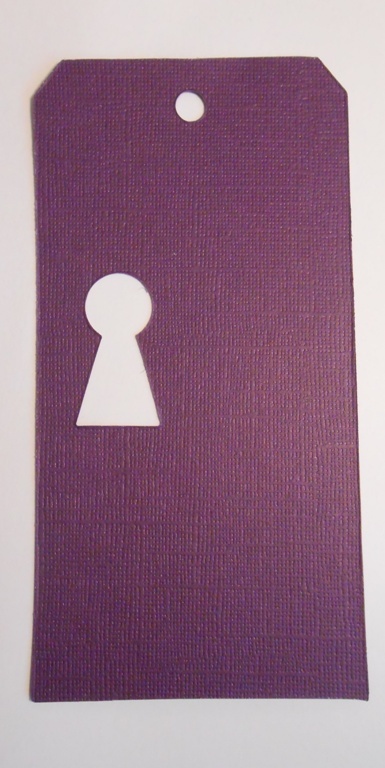 I then took a piece of cardboard that I had kept on hand from a scrapbook package I had received in the mail. 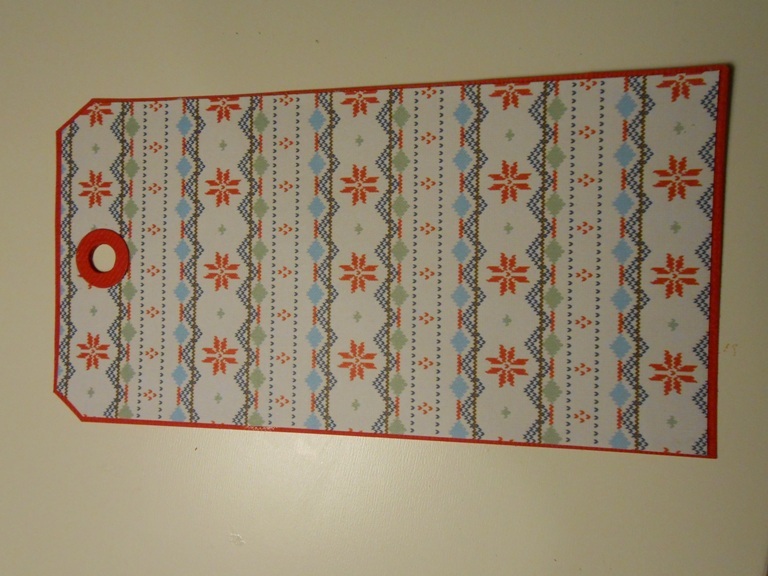 The cardboard had been used to back some patterned paper so it wouldn’t get bent during shipment. 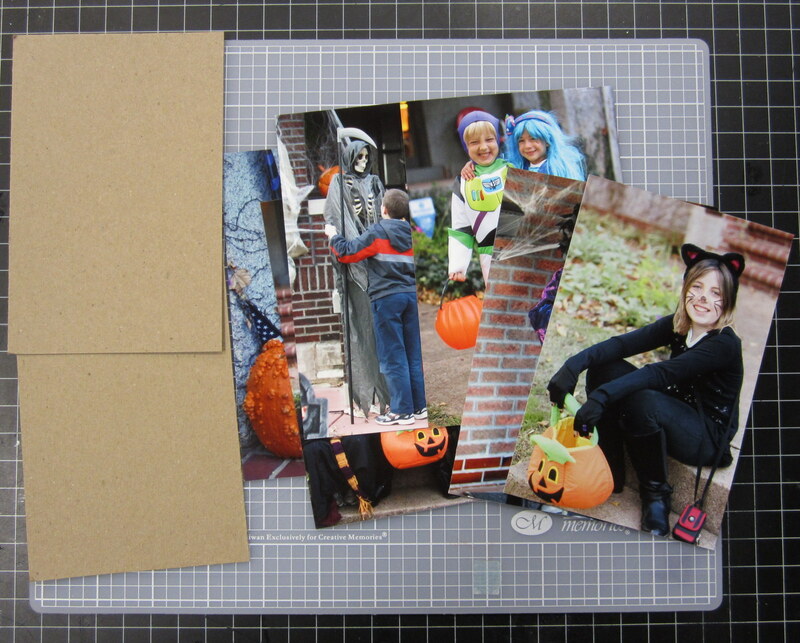 I cut it the down to the same size as my photos for my front and back covers. From then on my process was pretty simple. 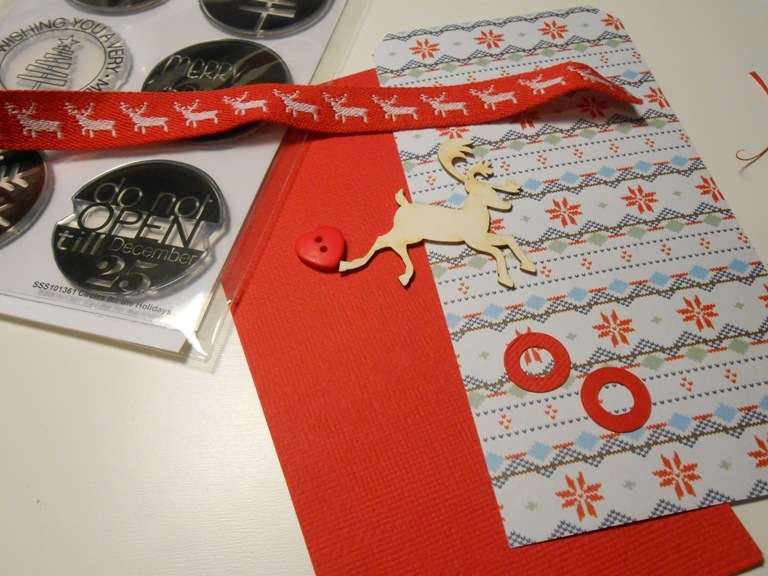 I decorated my cover with patterned paper, chipboard and stickers. 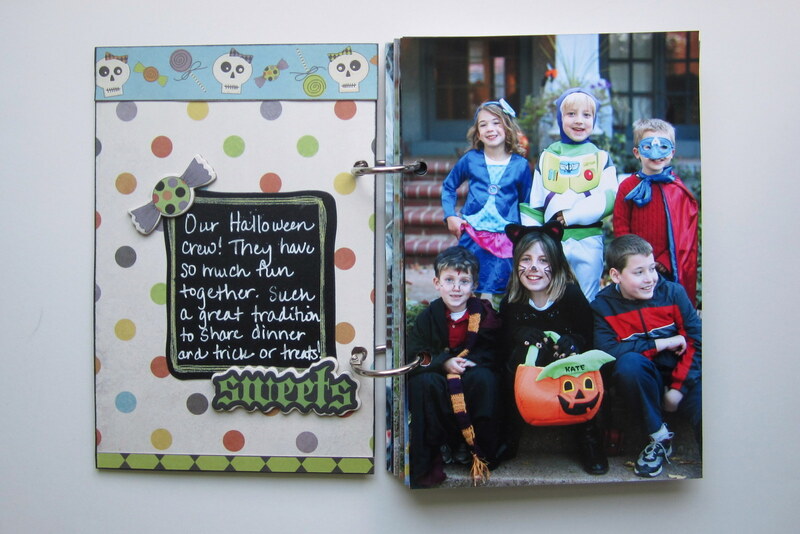 Each page follows a similar theme – patterned paper, borders, a journal spot, and some embellishments. 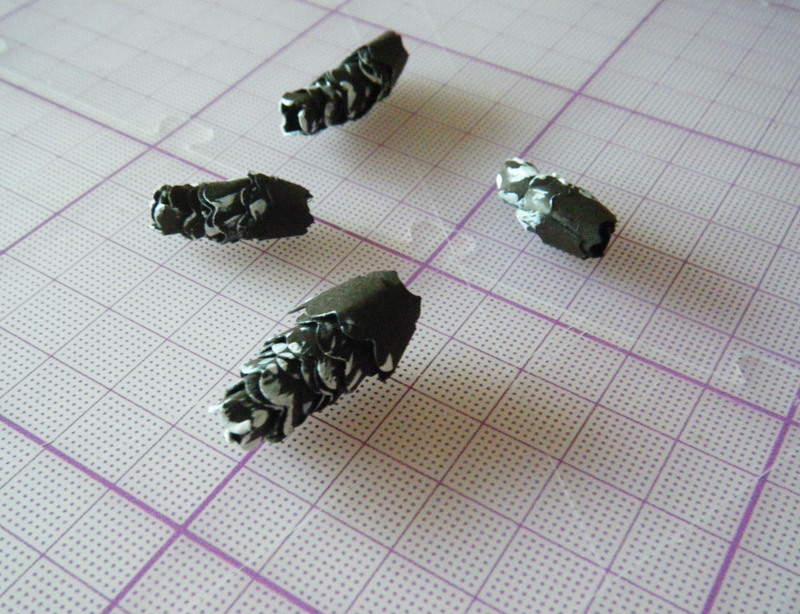 I decided to use chalkboard stickers by American Crafts because they worked really well with my white pen. 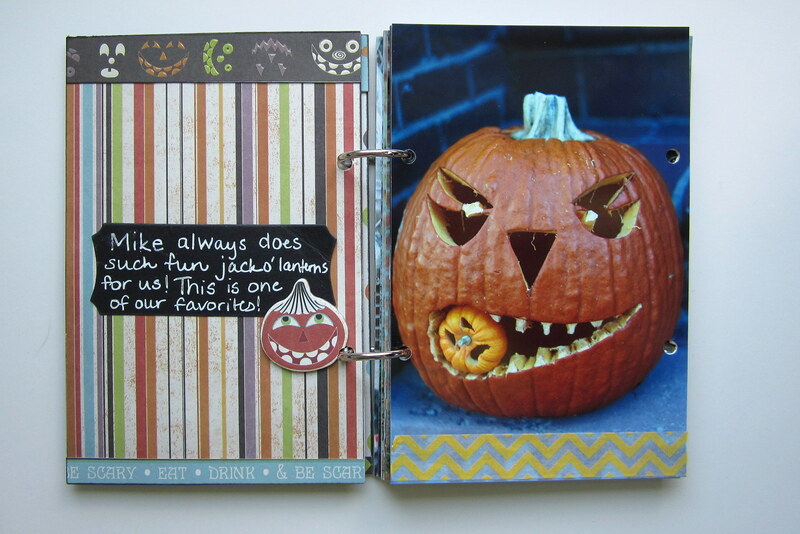 And here are the rest of the pages from my album. I hope you enjoyed seeing my little mini album today. 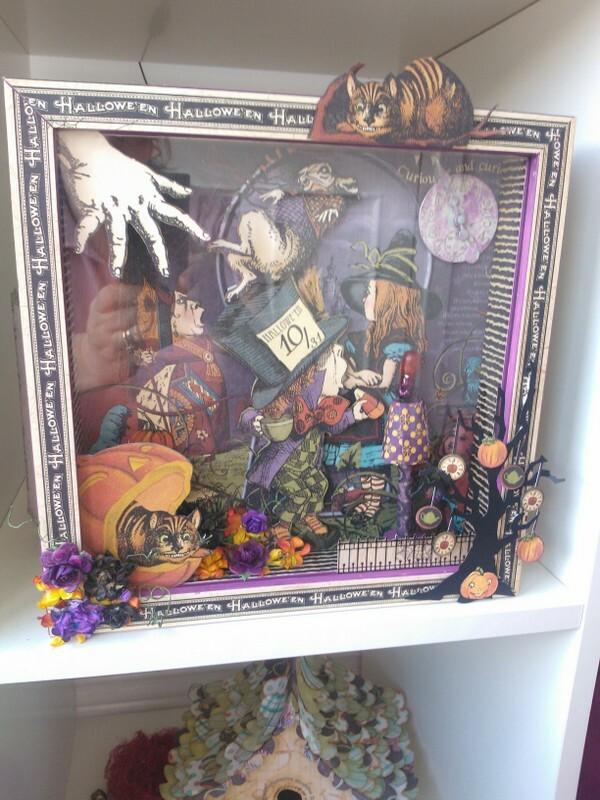 And that it gets you in the mood for some Halloween scrap time! 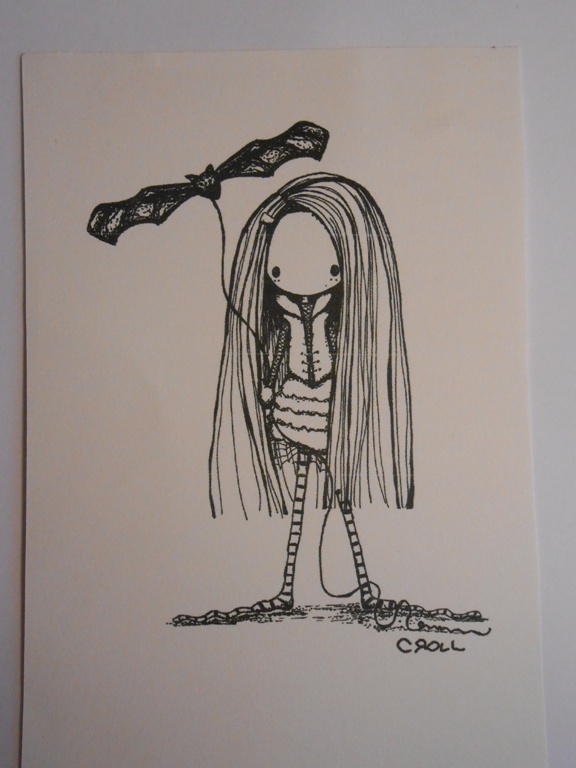 Hi everyone, it is Timi here with a fun Halloween tag. 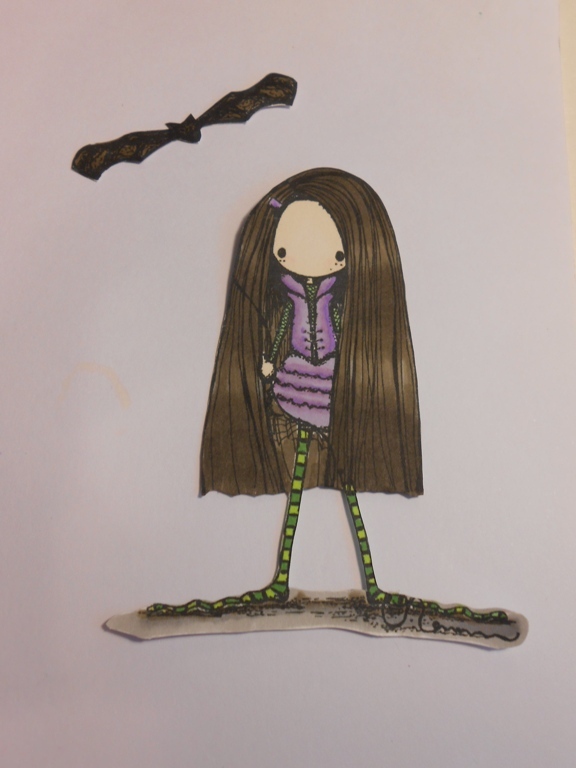 Colour the image with markers or other media and cut it out. 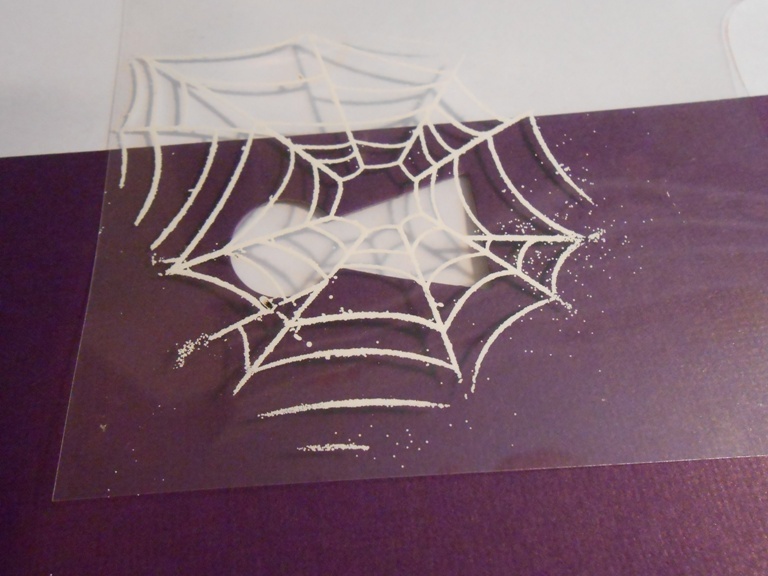 Stamp the spiderweb on the acetate and heat emboss it with white embossing powder. 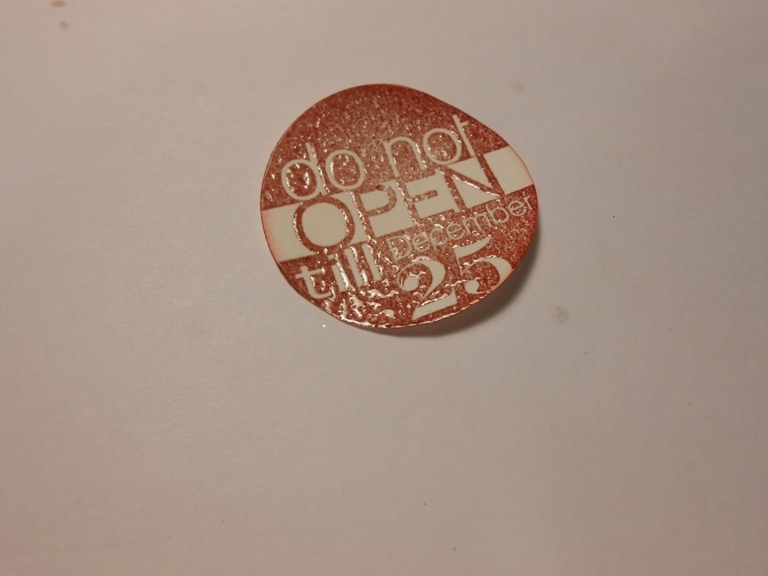 Adhere the acetate on the back of the tag. Cut off the excess. 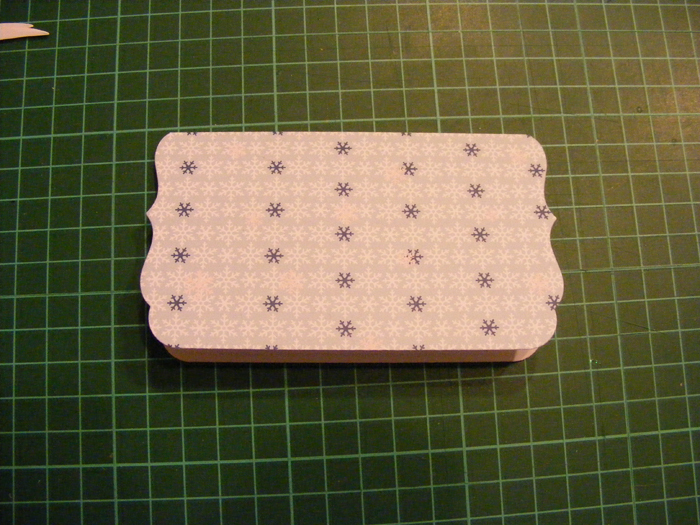 Add some washi tape and patterned paper to the front of the tag. 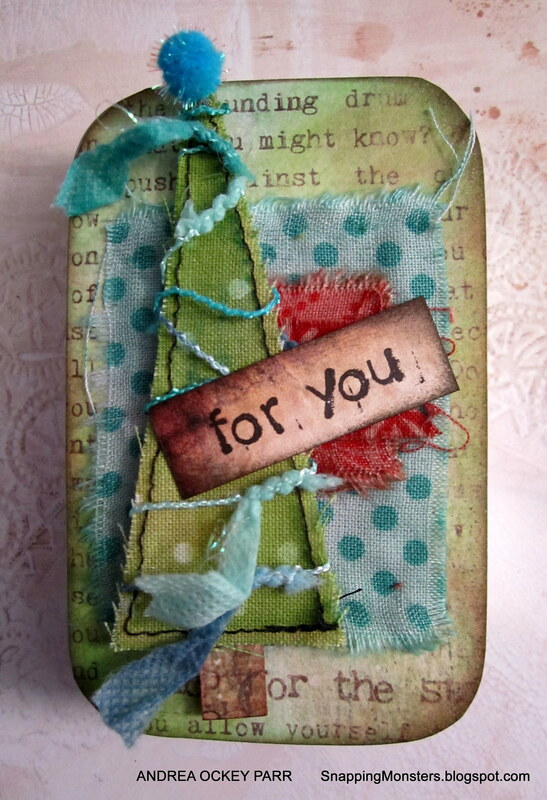 Add sentiment, embellishments and the coloured image. 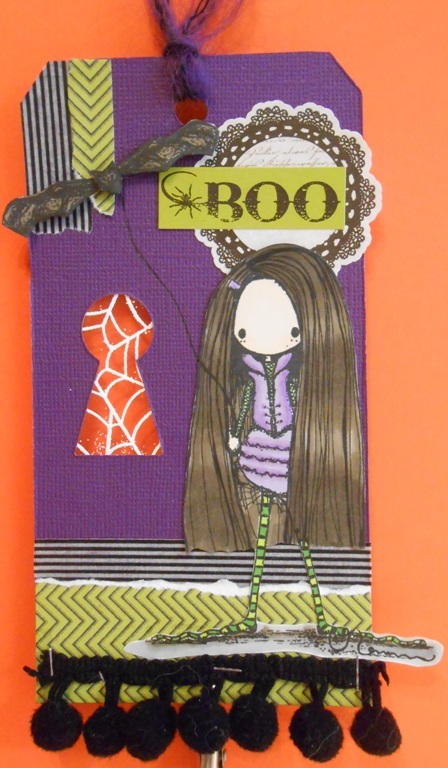 And there you have a cute Halloween tag!! Any other Halloween projects coming up? Watch this space! 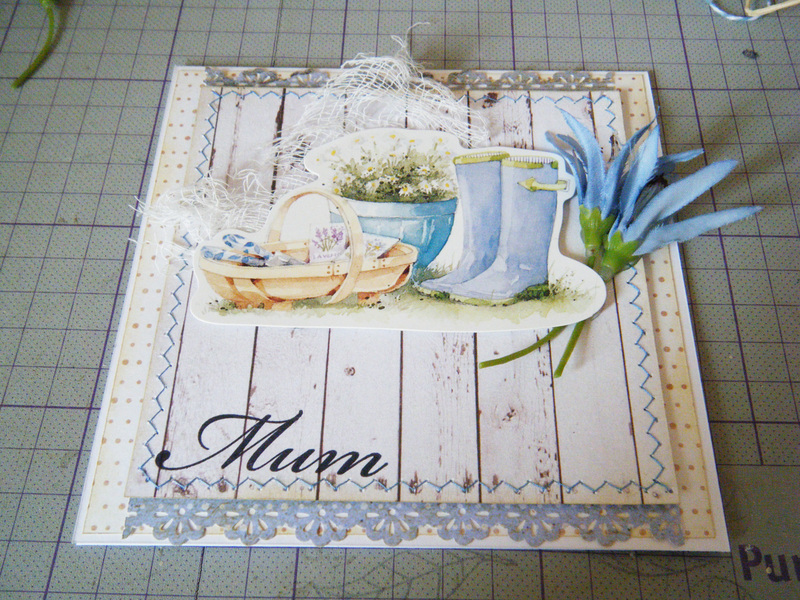 Today, Karen is sharing a great 3D frame tutorial with us. 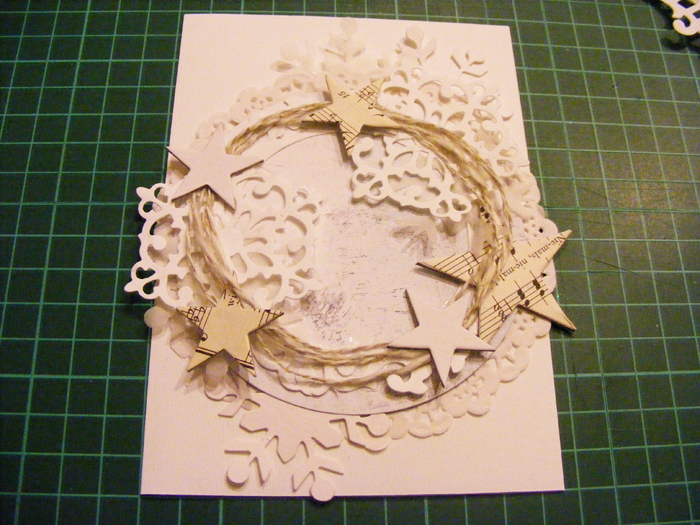 This project can be done for any occasion including baby births and Christmas. 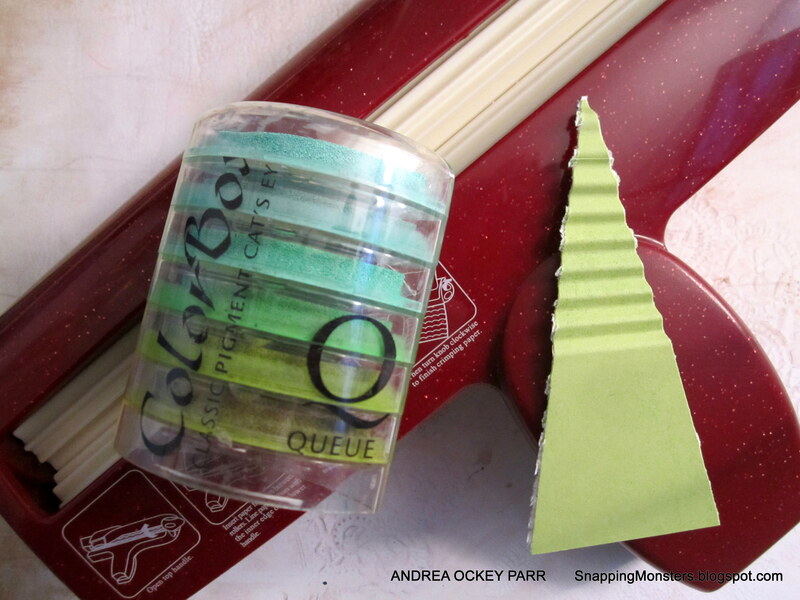 It is a lovely way to use those precious pieces of paper that you have been saving! Ideology by Tim Holtz: Metal clock and hands and light bulb. 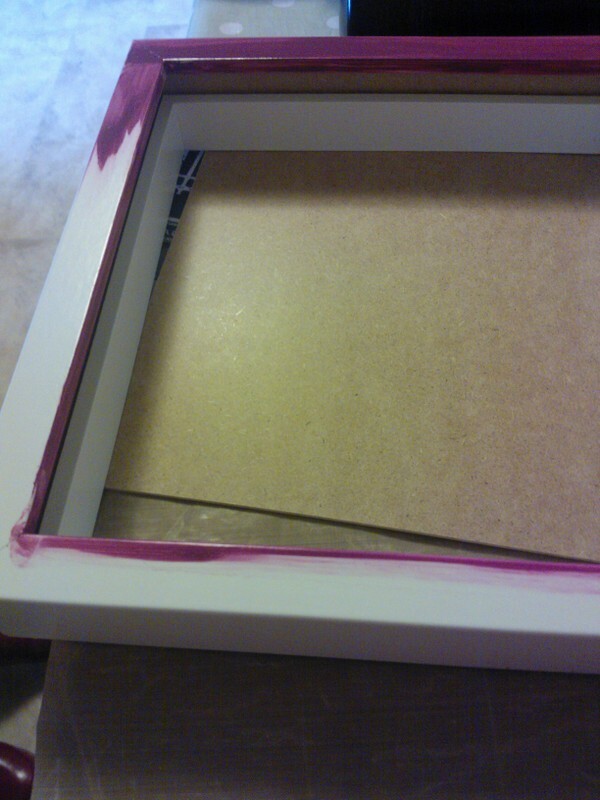 Paint the frames 2 parts inside and out using the Seedless Preserves Distress Paint. 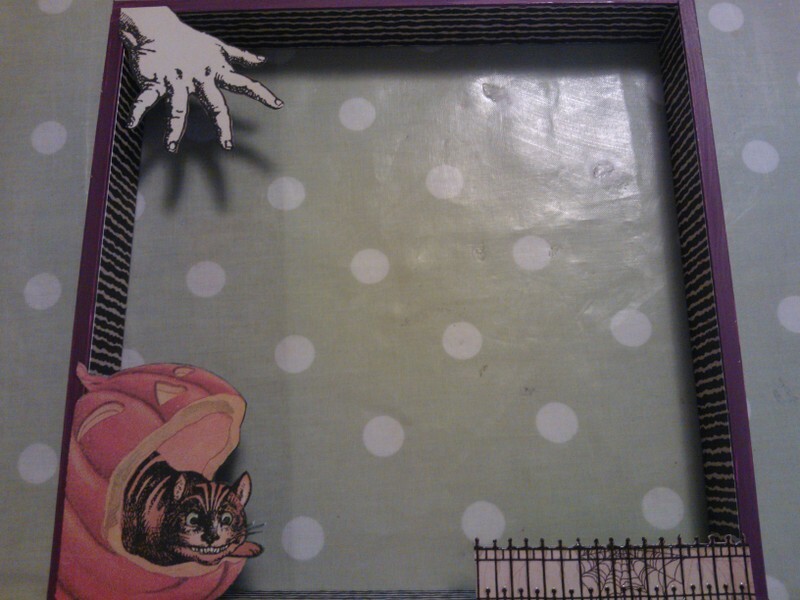 For the main image I chose the ‘Halloween in Wonderland’ paper. Cut the image to size. 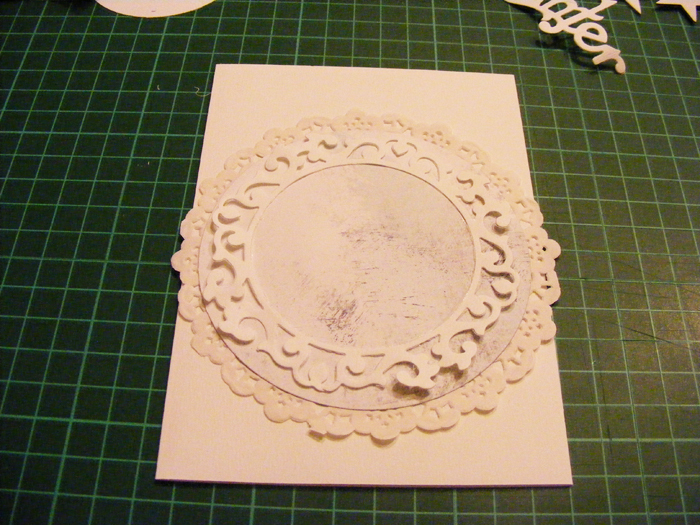 For the 3d images fussy cut the paper ‘Through the Looking Glass’. 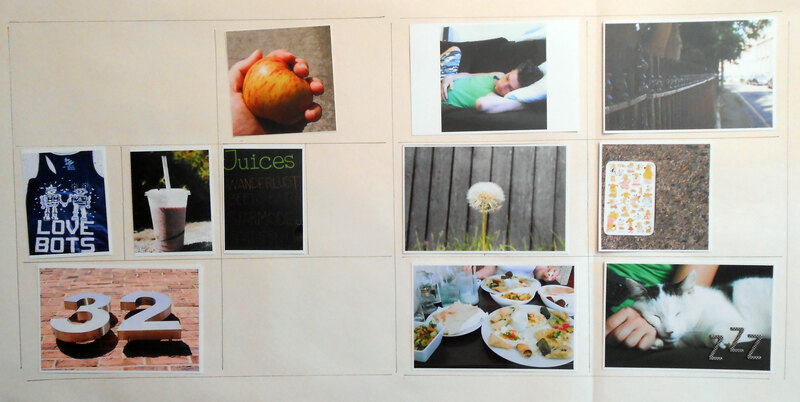 This sheet has lots of different images that can be layered up. 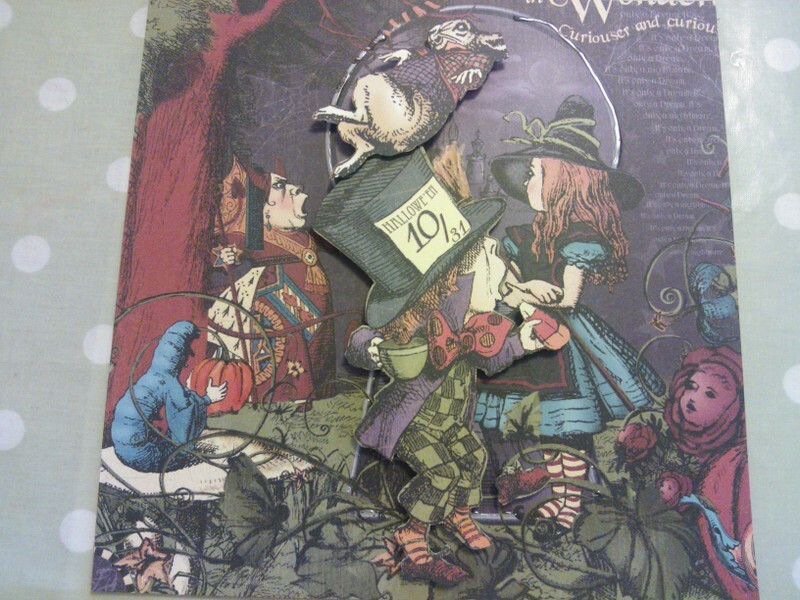 Using foam pads stick the Mad Hatter and White Rabbit to the background image. Next stick the hand, the fence and the pumpkin to the top of the inner frame. 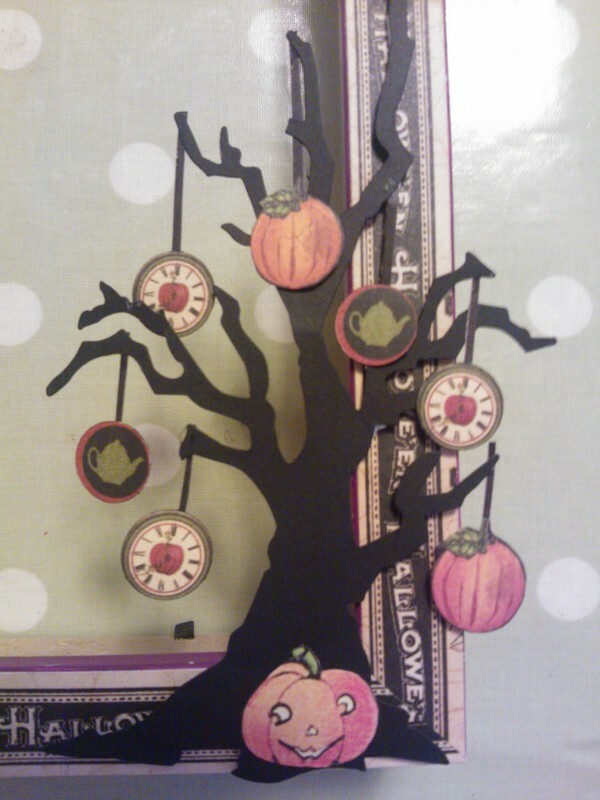 Die cut the Branch Tree from black cardstock and hang pumpkins, clocks and teapots from it. 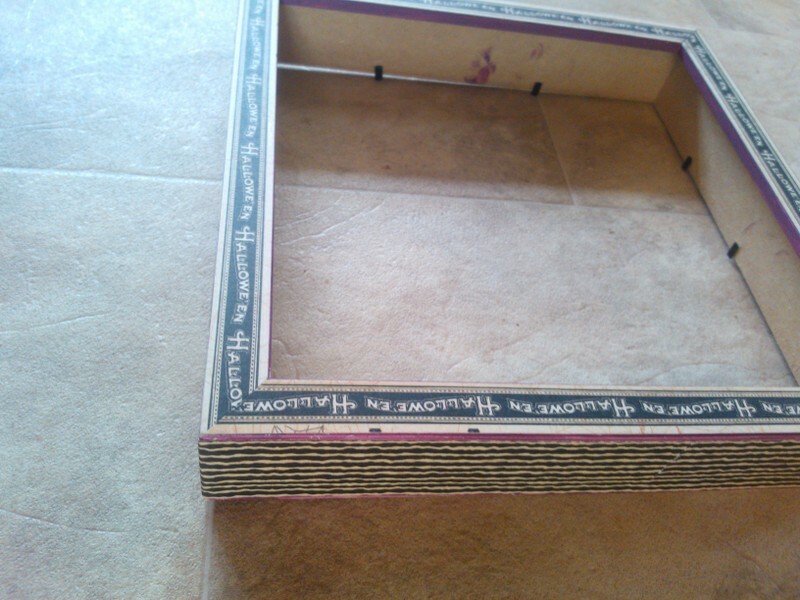 On the outside of the frame stick the tree and the Cheshire cat using foam pads. Paint the face and hands of the clock piece using Antique Linen and Seedless Preserves distress paint. 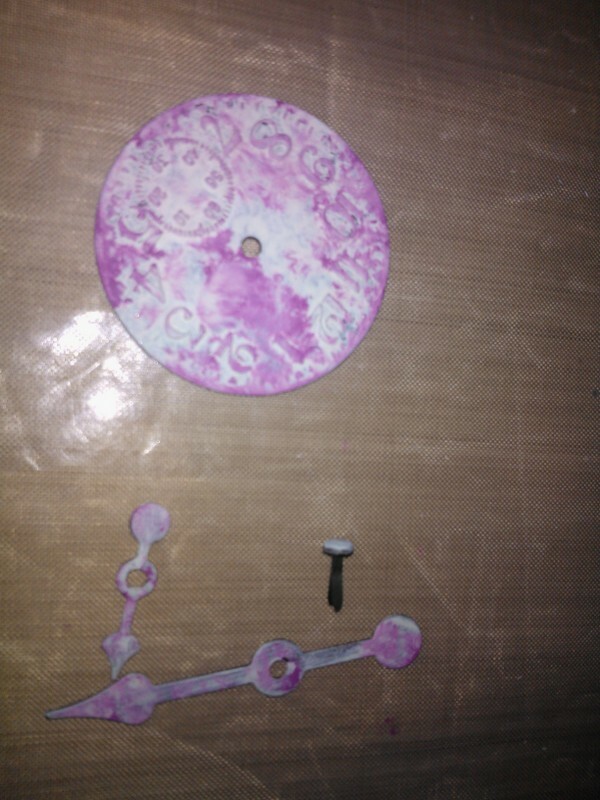 When the paint is dry, gently sand the clock face back to reveal the metal underneath. 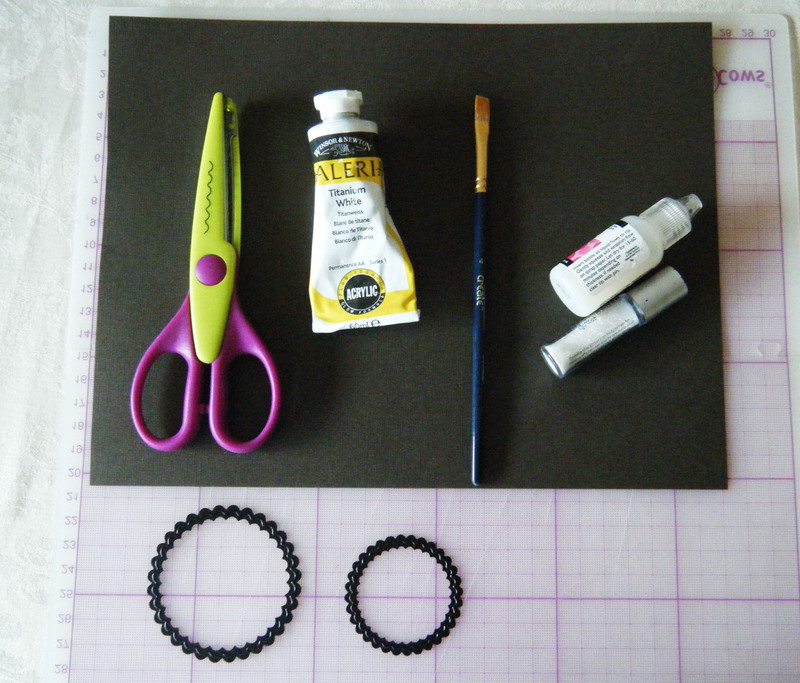 Stick to background using foam pads. 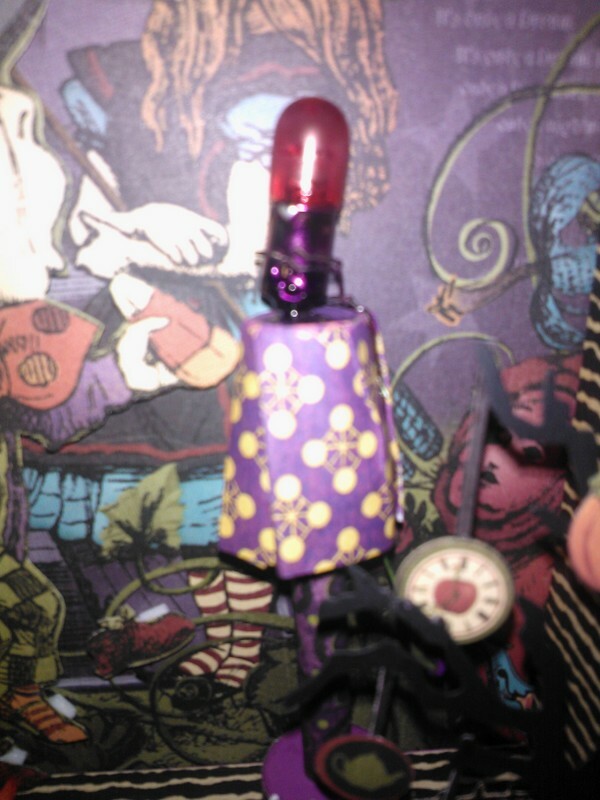 To make the lamp I stole a little wooden lamp from my daughters Dolls House! Paint the base with Seedless Preserves distress paint, and then cover the lamp with patterned papers. Add a light bulb which has been coloured with alcohol inks to the top of the lamp and stick inside the frame. 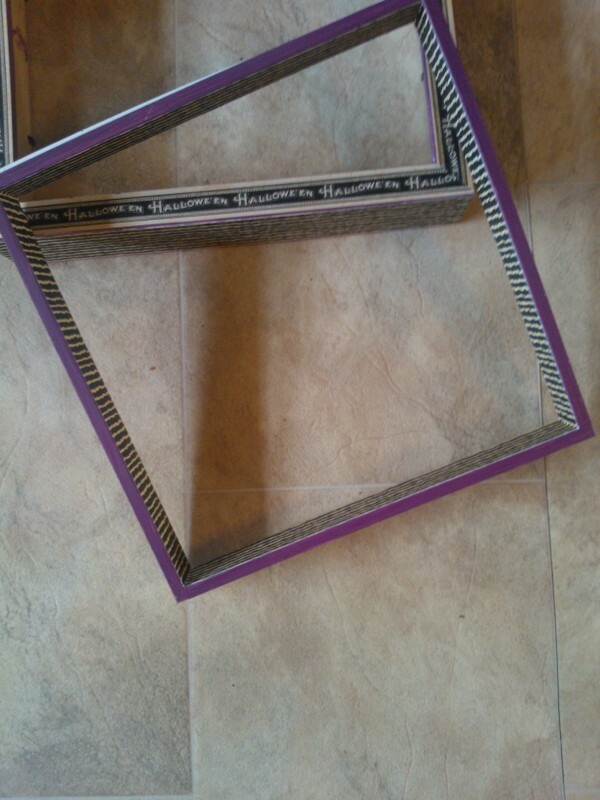 Spray some white flowers with Dylusions inks and add both inside the frame and to the front of the frame. What a great 3D project! !